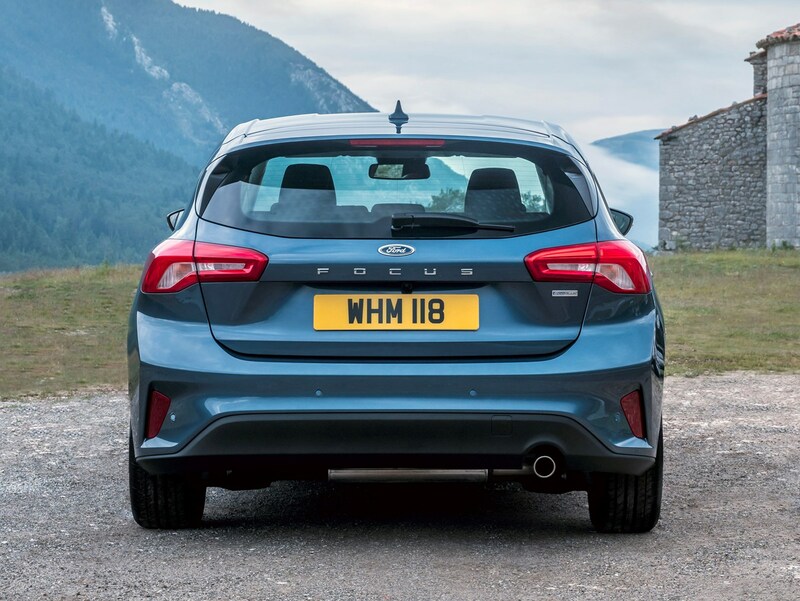 Since it was launched in 1998, the Ford Focus has gone on to become of the UK’s biggest selling cars – and it’s not hard to see why. 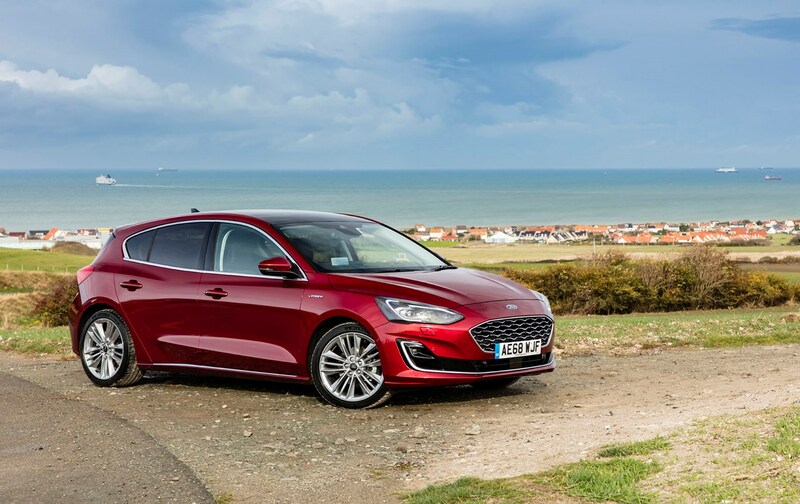 Blessed with striking styling and a razor-sharp drive, the original was a breath of fresh air in a segment of the market that needed new life, and although 2019’s crop of family hatchbacks resembles far tougher competition, the Mk4 Focus still stands out. 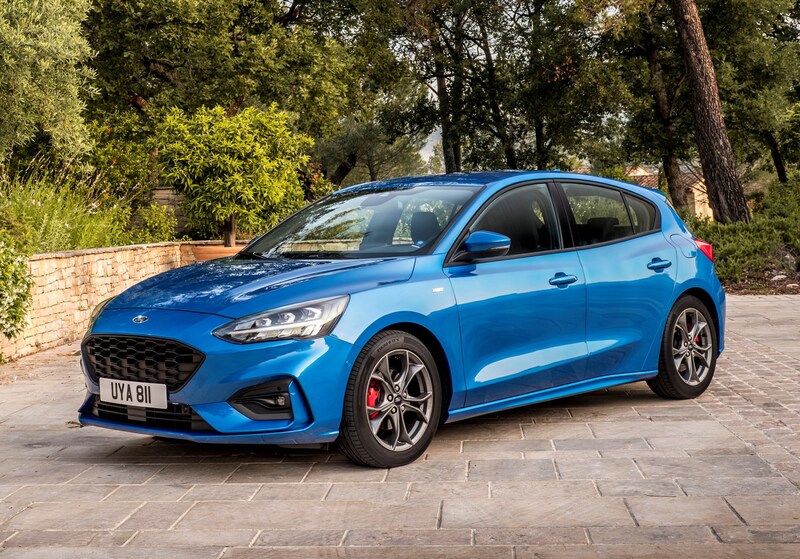 Based on an all-new platform, it’s sure to build on the two million Focus models already sold in the UK and has already bagged the 2019 Parkers Small Family Car award. 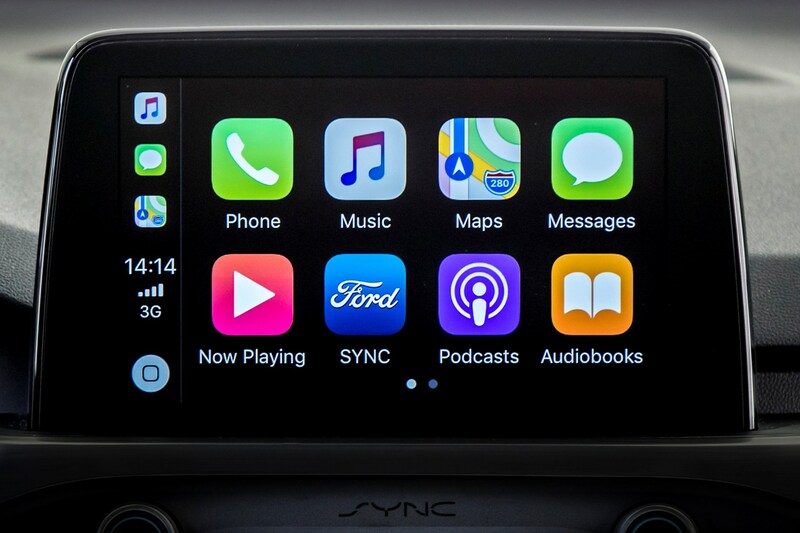 Not that that means Ford will have everything its own way. 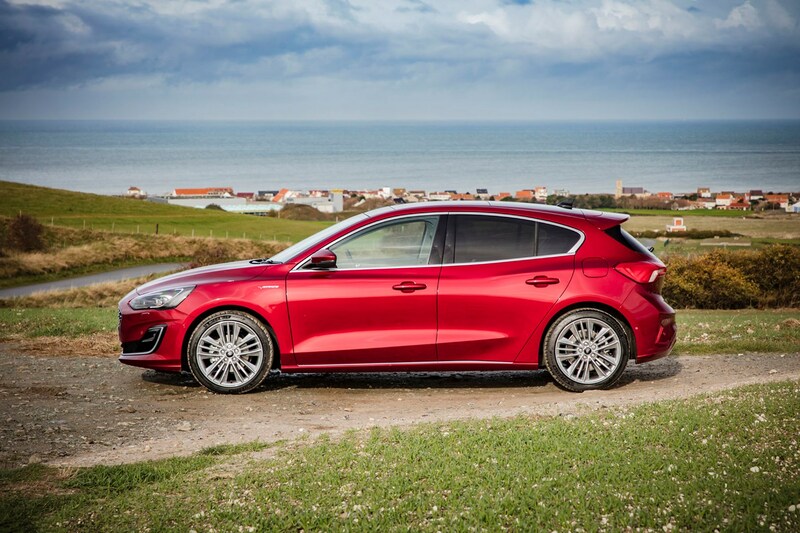 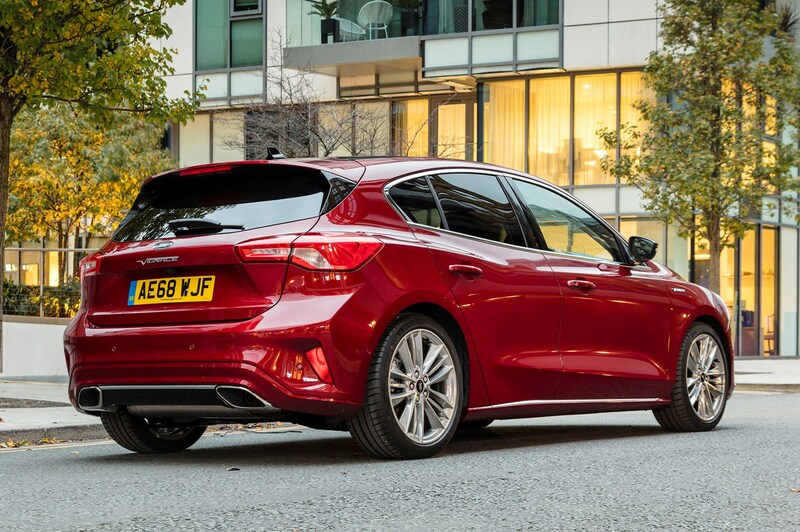 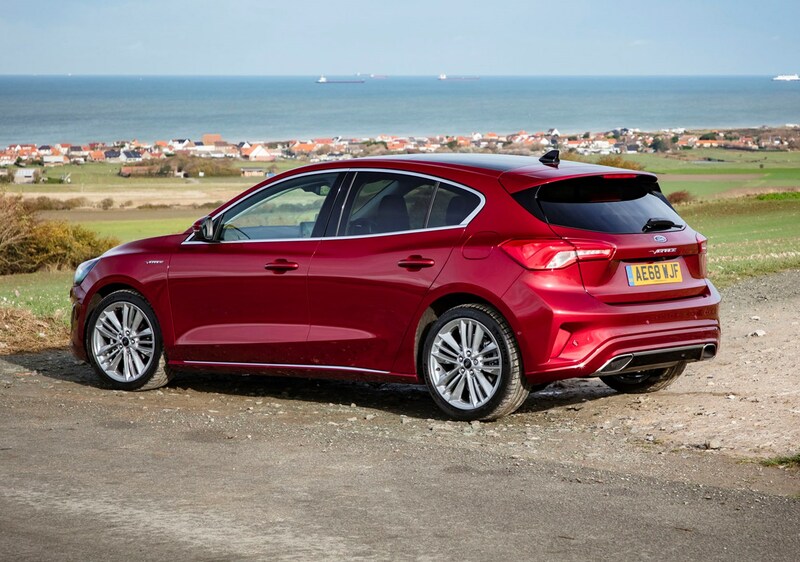 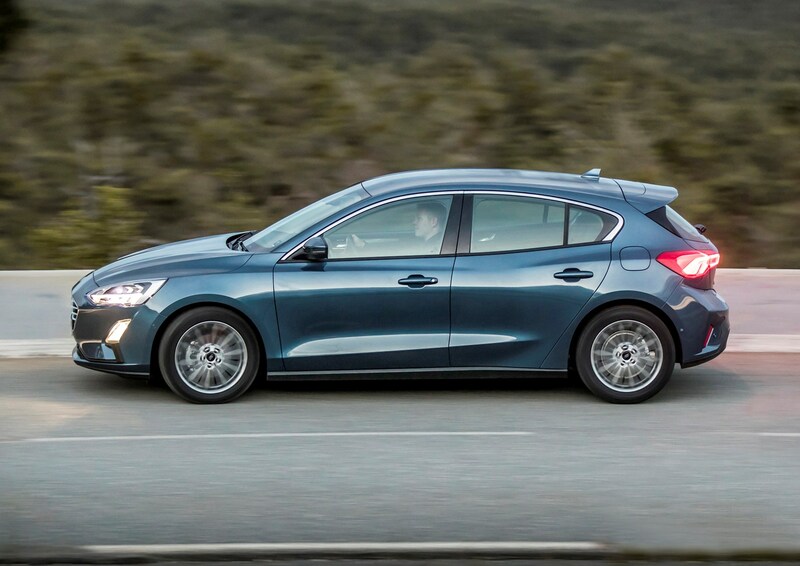 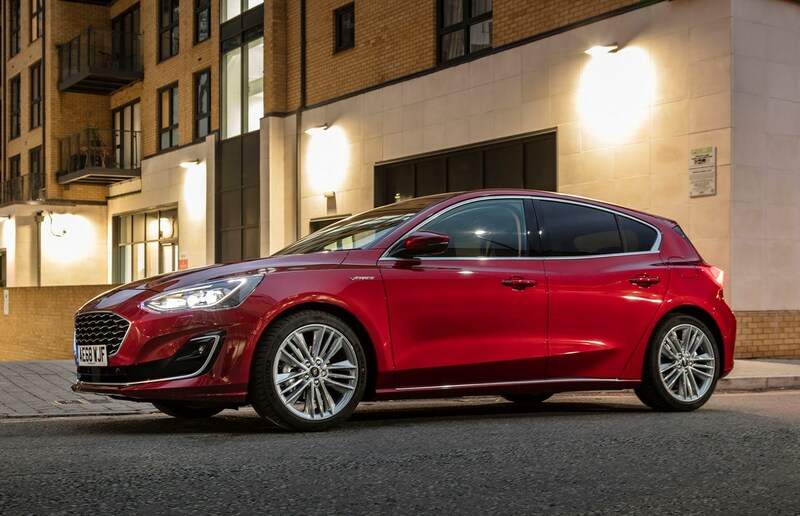 There’s the small matter of a wide and talented range of competition, including the Vauxhall Astra, Mazda 3, Hyundai i30, Kia Ceed and the evergreen Volkswagen Golf. 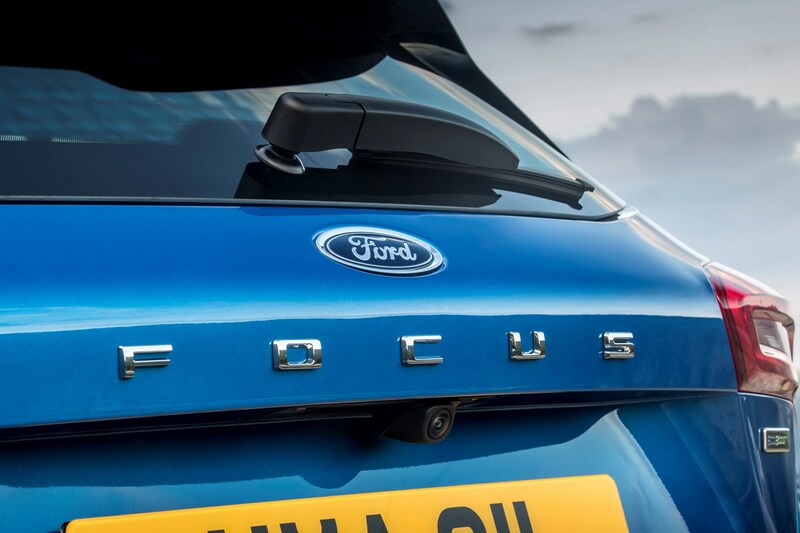 So, how does the Focus compare? 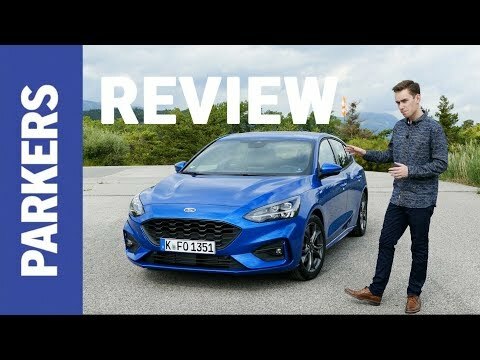 Is it still worth your cash? 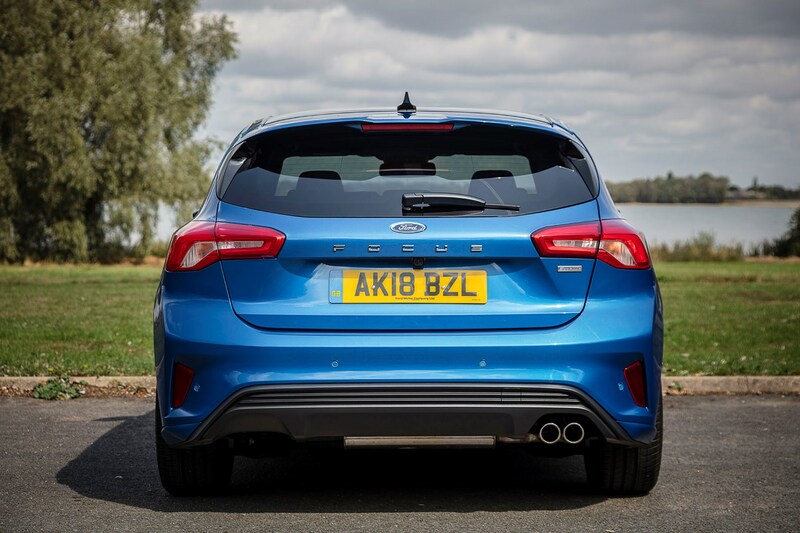 Read on for the in-depth Parkers verdict. 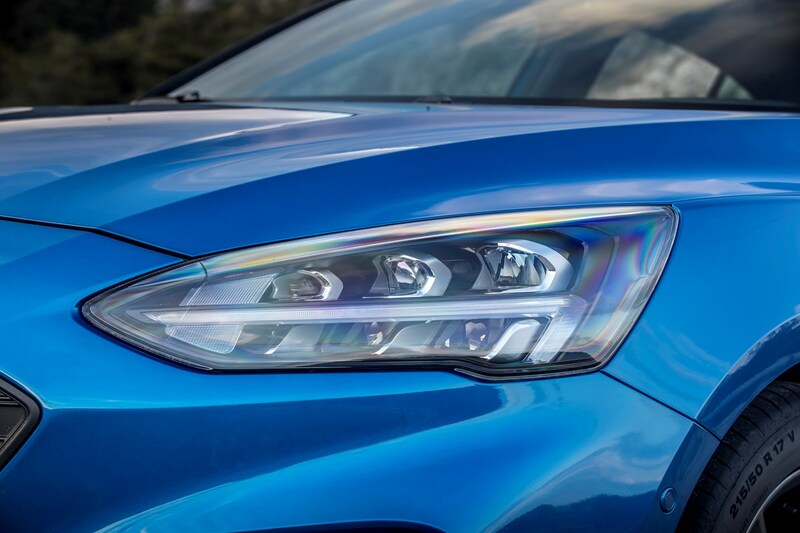 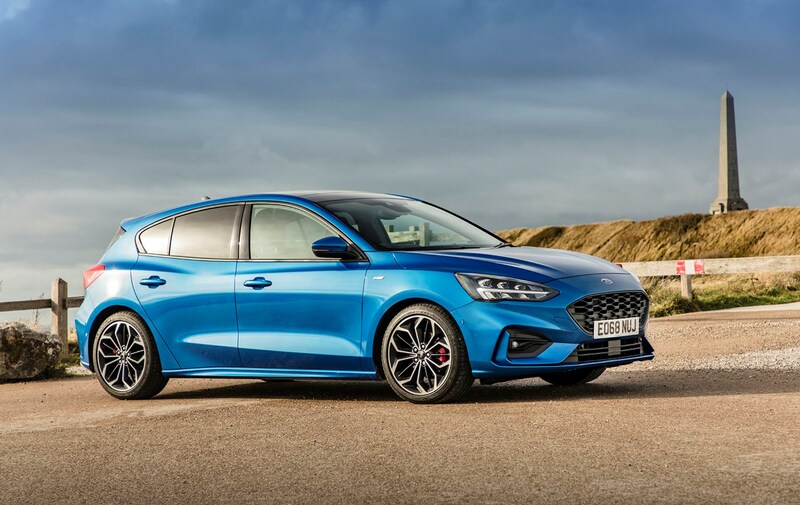 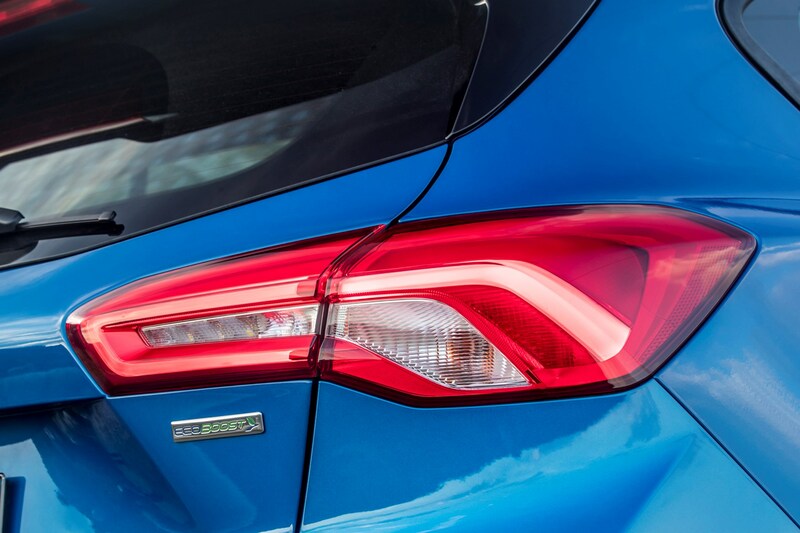 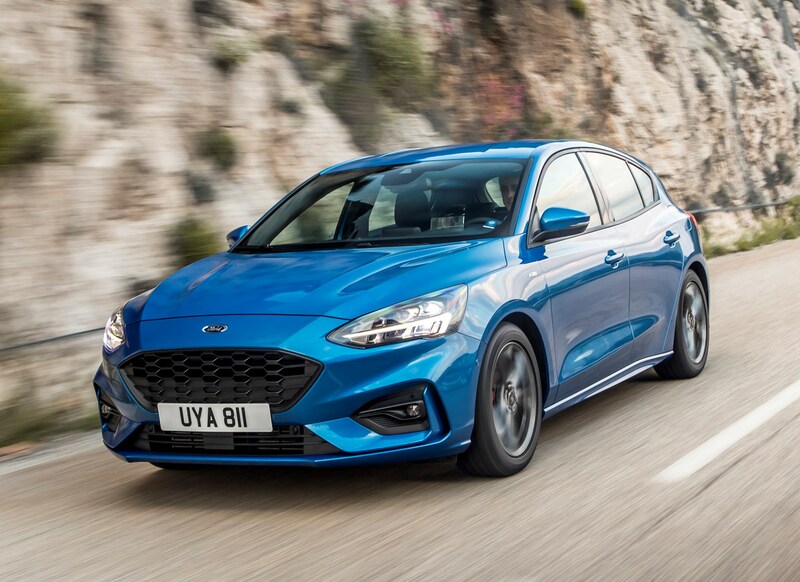 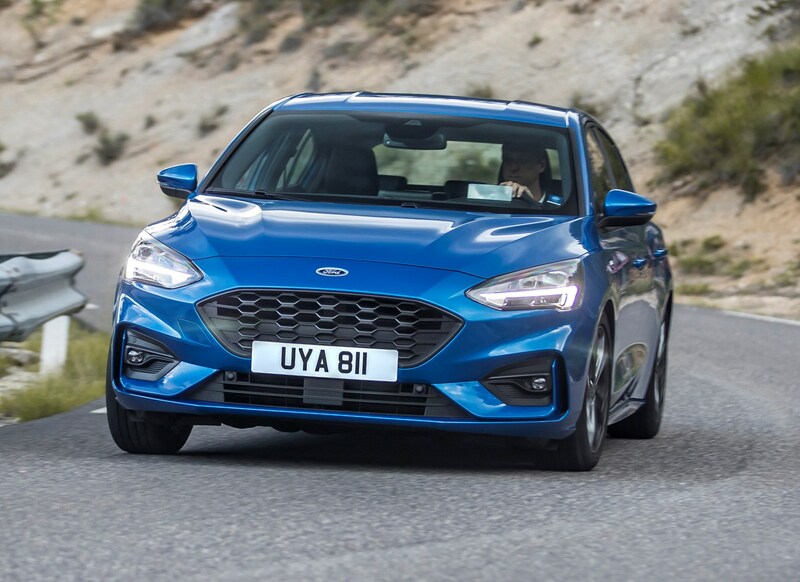 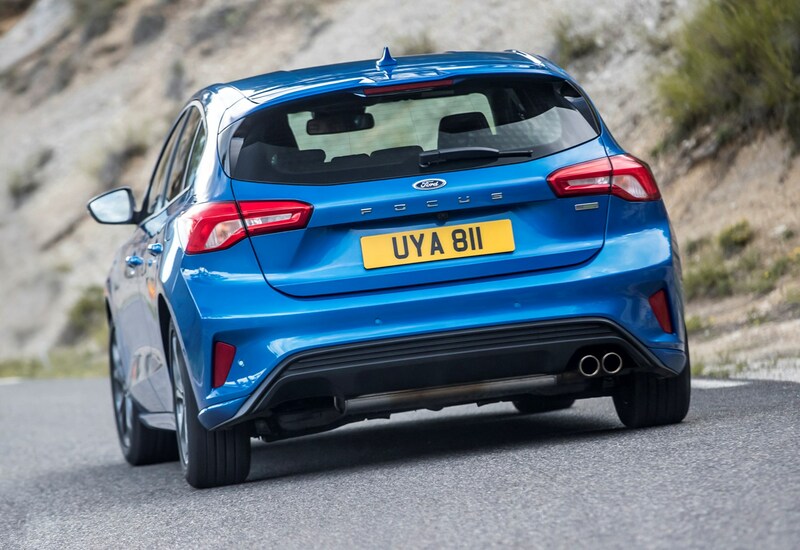 Ford has been accused of letting the overall drive of its vehicles slip in recent years, but if the latest generation Fiesta (and especially the Fiesta ST) was an indication that this is no longer the case, the fourth-generation Focus is a signed and sealed confirmation. 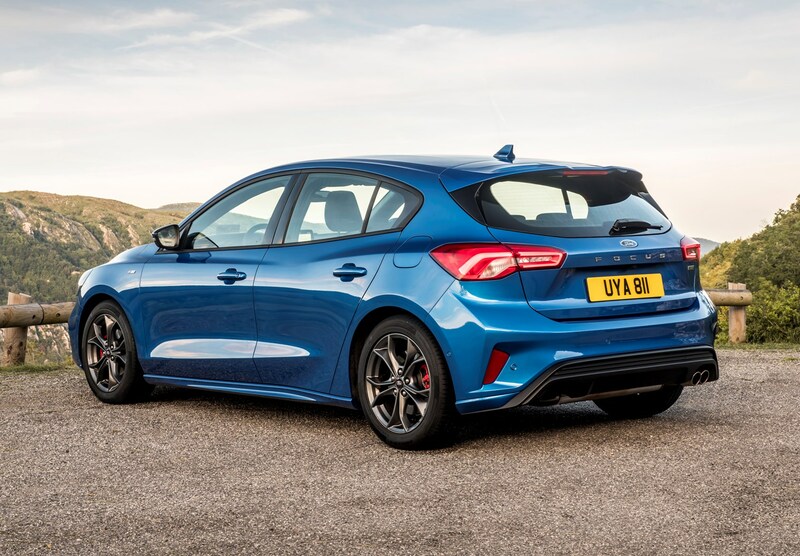 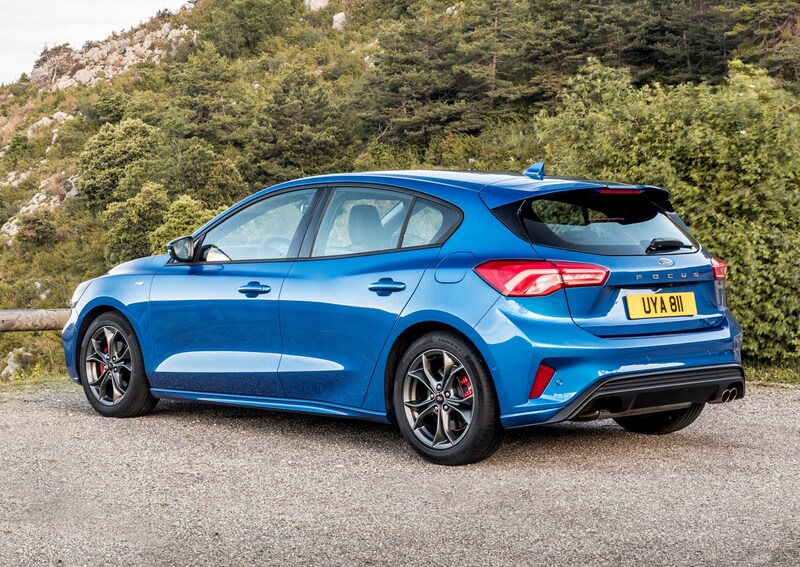 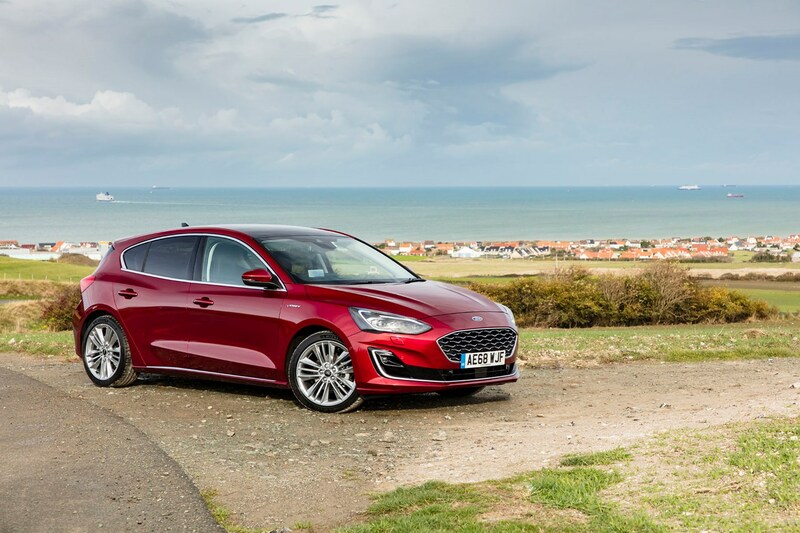 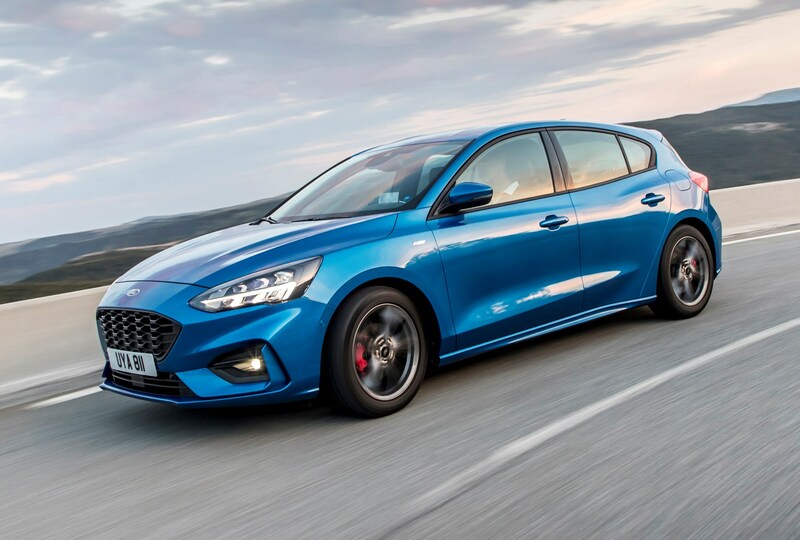 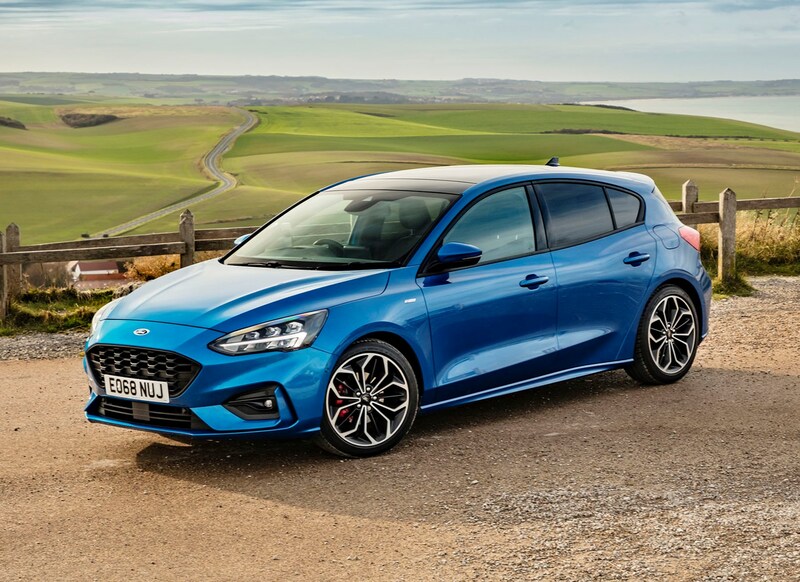 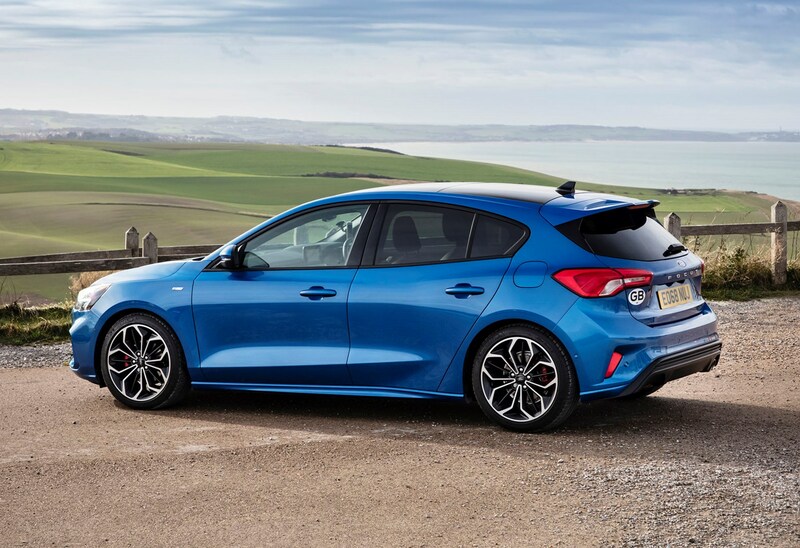 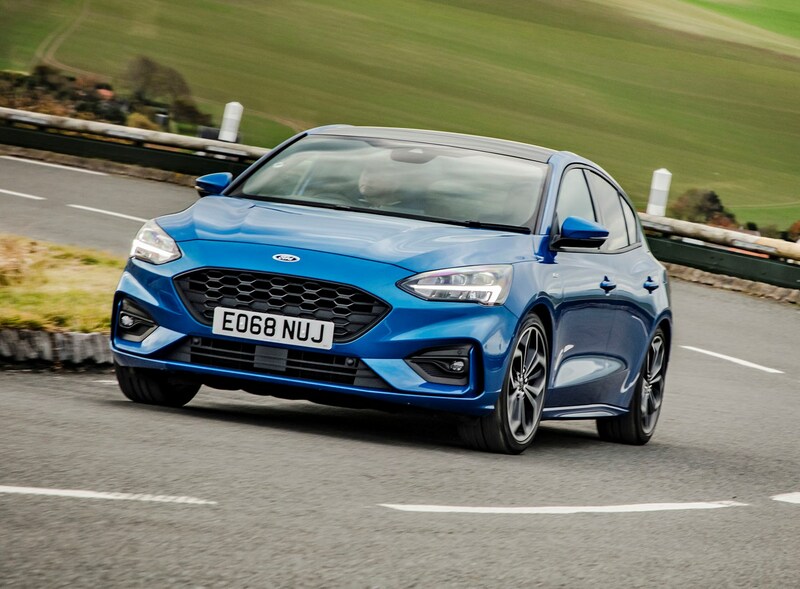 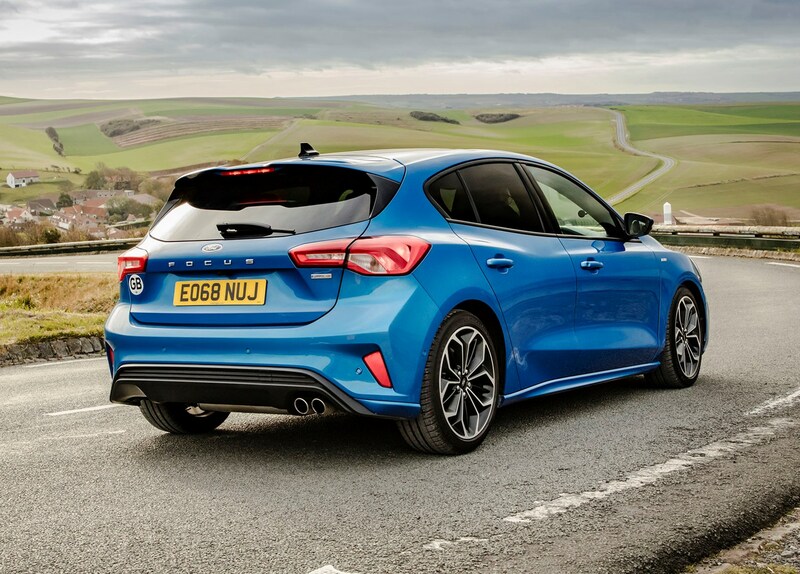 The ST-Line models in particular – with their lowered suspension – are enormous fun when the road gets twisty, delivering balanced body control (how little the body of the vehicle leans through corners), quick responses and bags of grip. 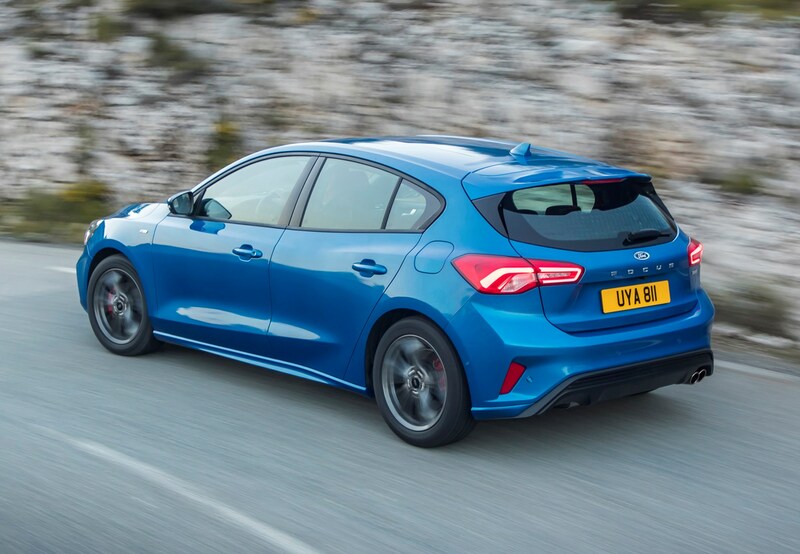 As far as medium-sized hatchbacks go, this is pretty much as good as it gets. 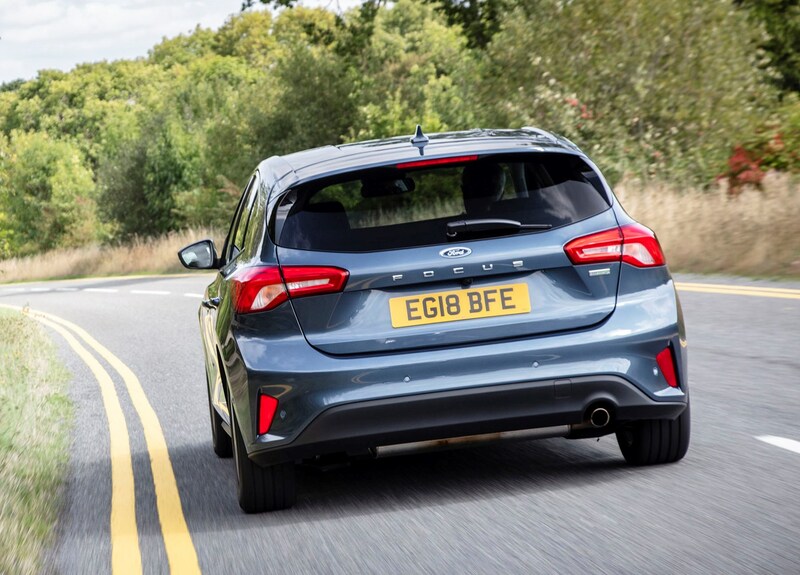 Slow down and take things easy, however, and the Focus still delivers a polished all-round drive. 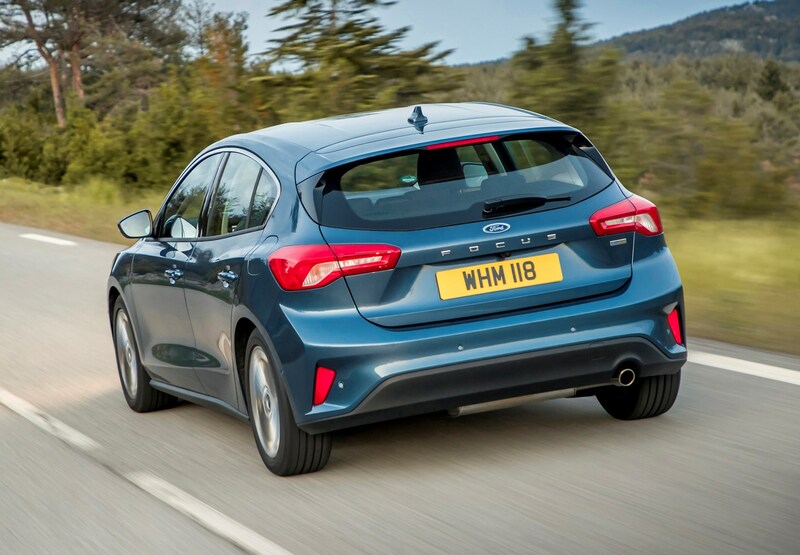 Road and wind noise are impressively low, while the ride on cars with multilink rear suspension (cheaper models come with a less sophisticated twist-beam set-up) is superbly well judged, feeling neither too floaty nor too firm. 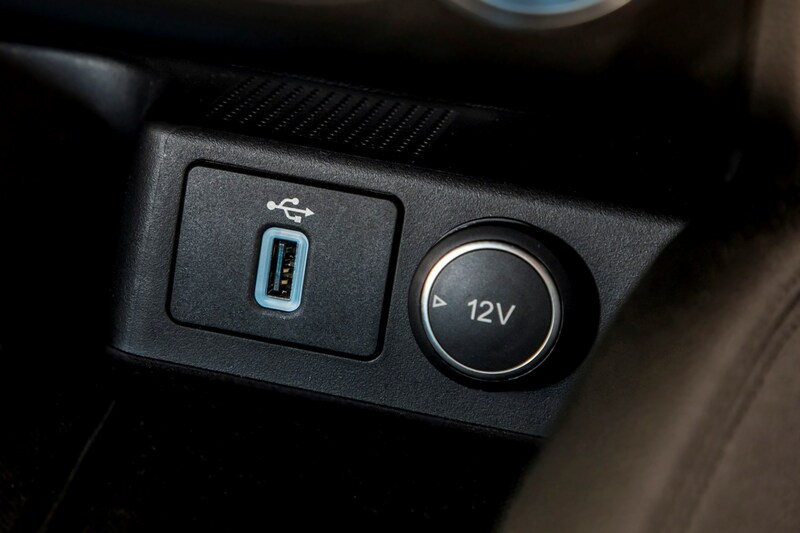 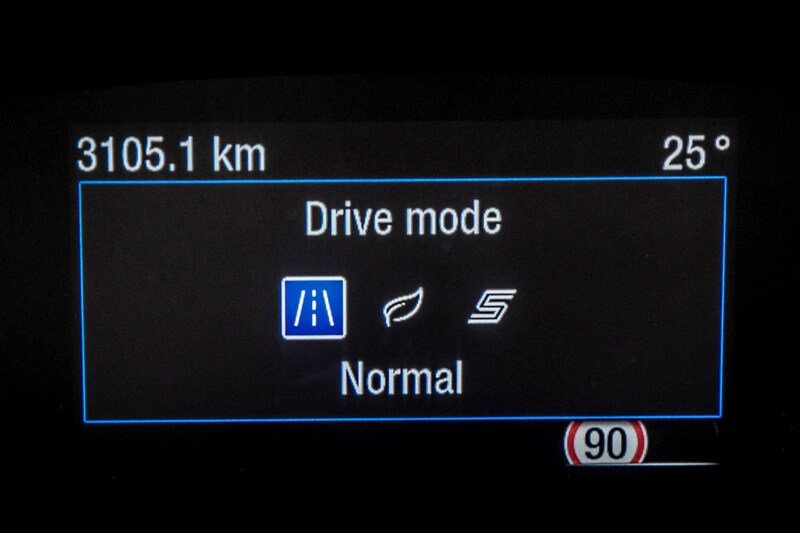 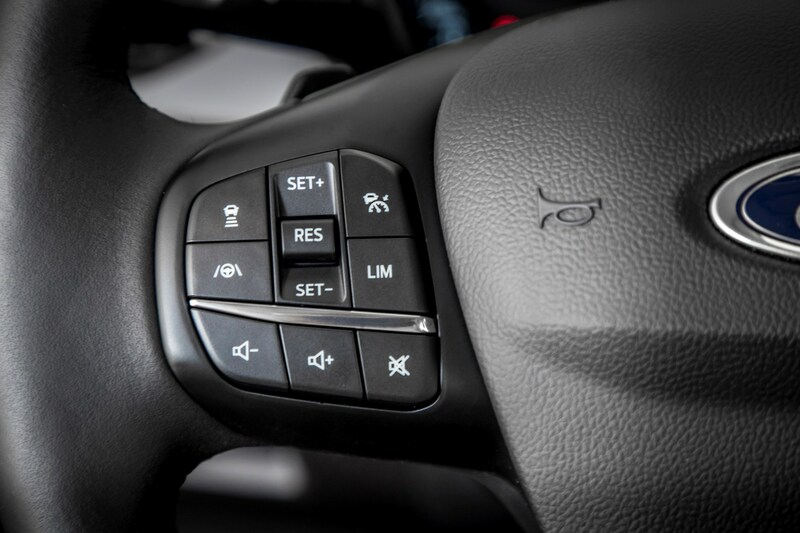 A drive mode selector is standard on all Focus models, tweaking the steering weight, throttle response, adaptive cruise control (if fitted) and adaptive dampers (if fitted) to change the vehicle’s driving characteristics. 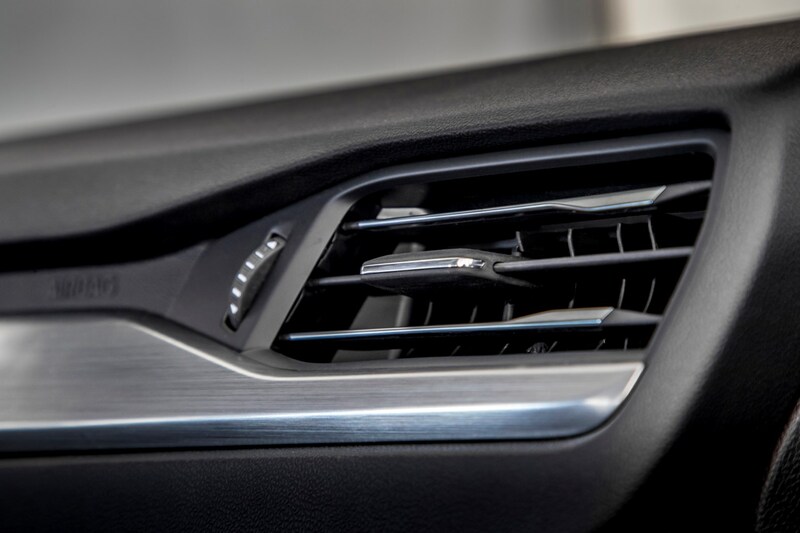 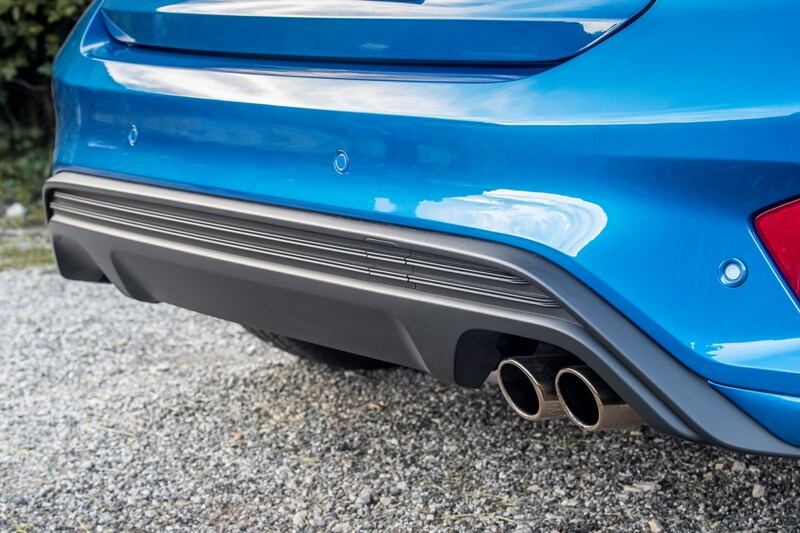 Unfortunately, however, the optional adaptive dampers (named Continuously Controlled Damping) do little to persuade you that they’re worth the extra cash. 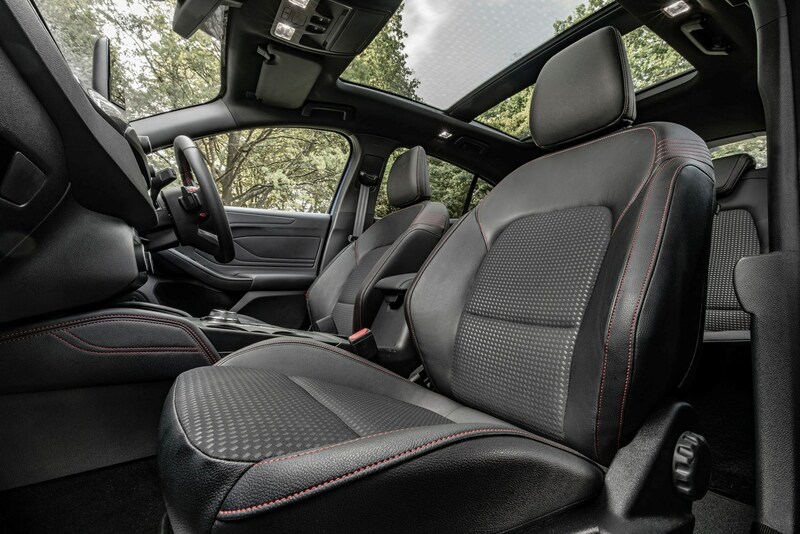 Not only is comfort not improved, but body control also takes a hit. 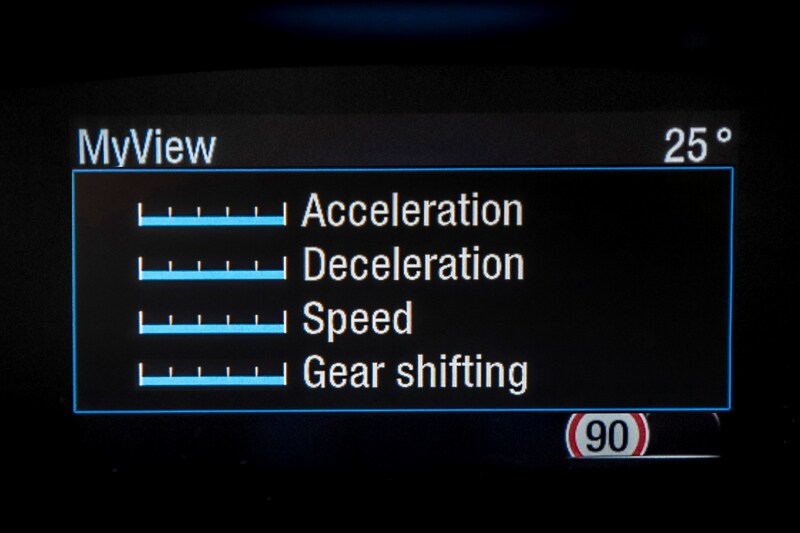 Best give that option a miss. 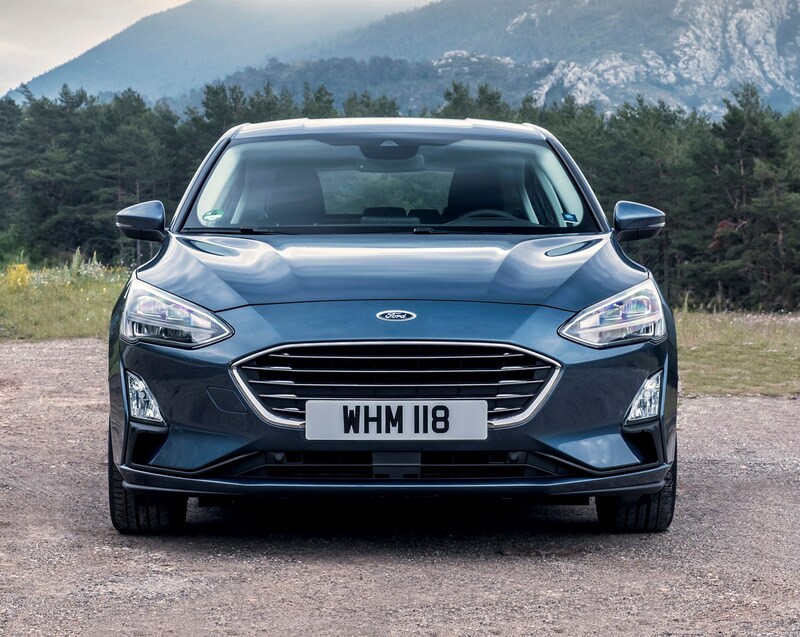 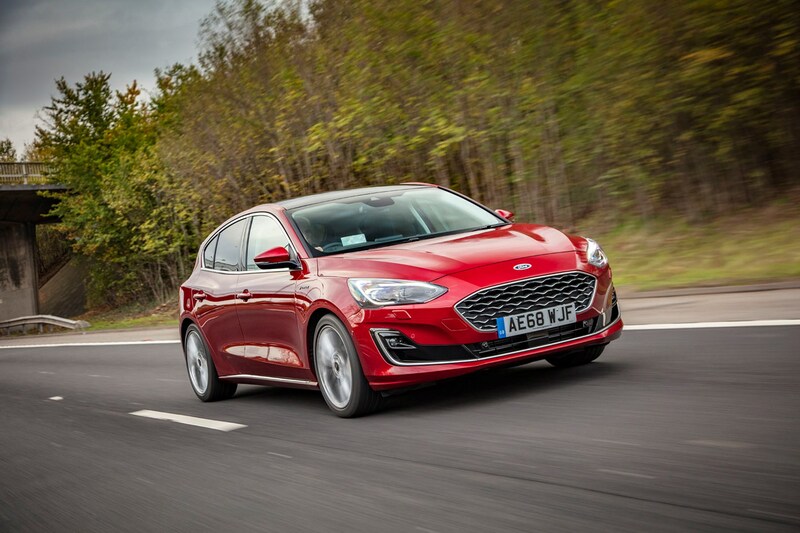 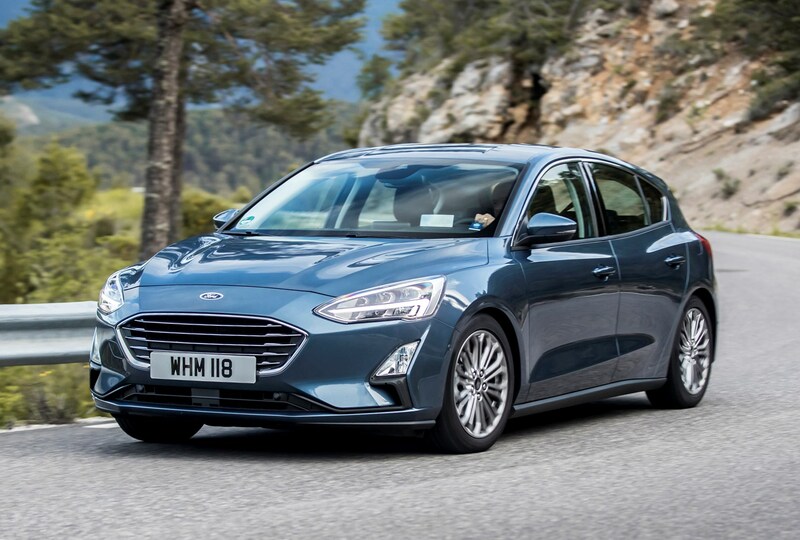 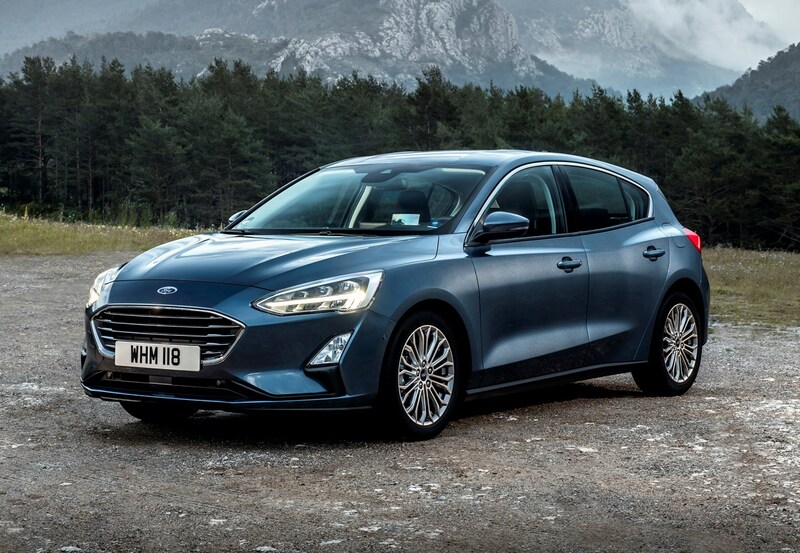 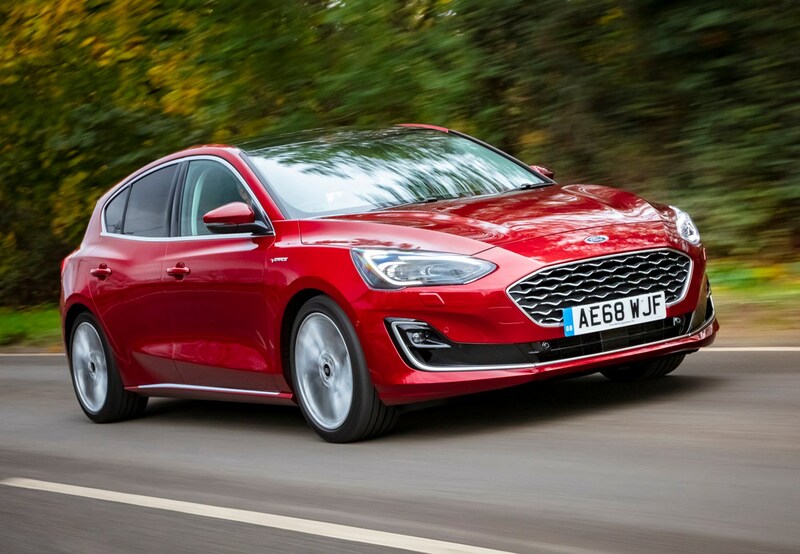 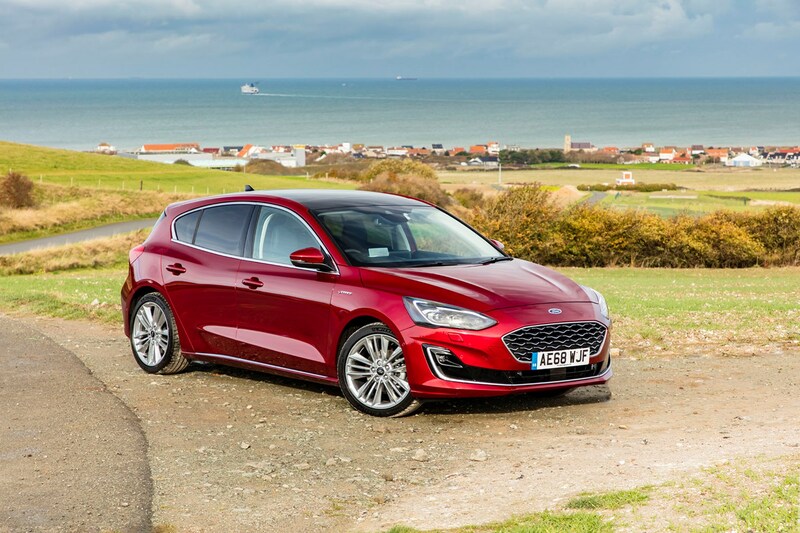 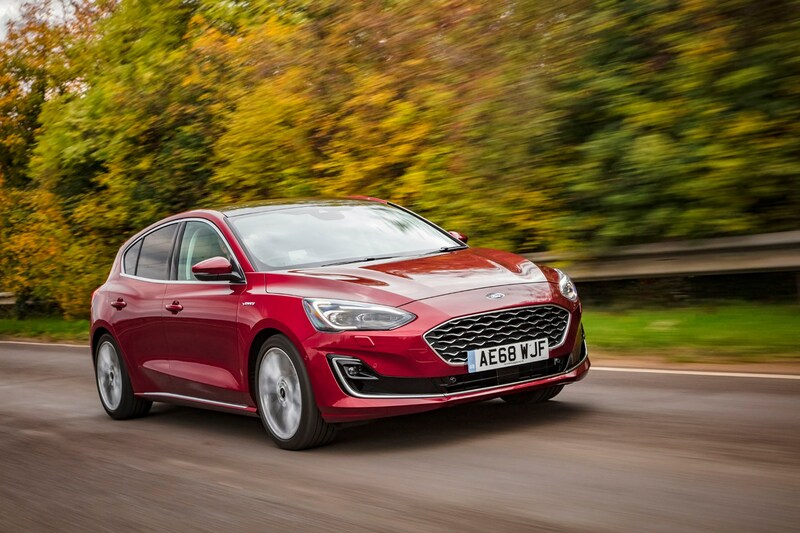 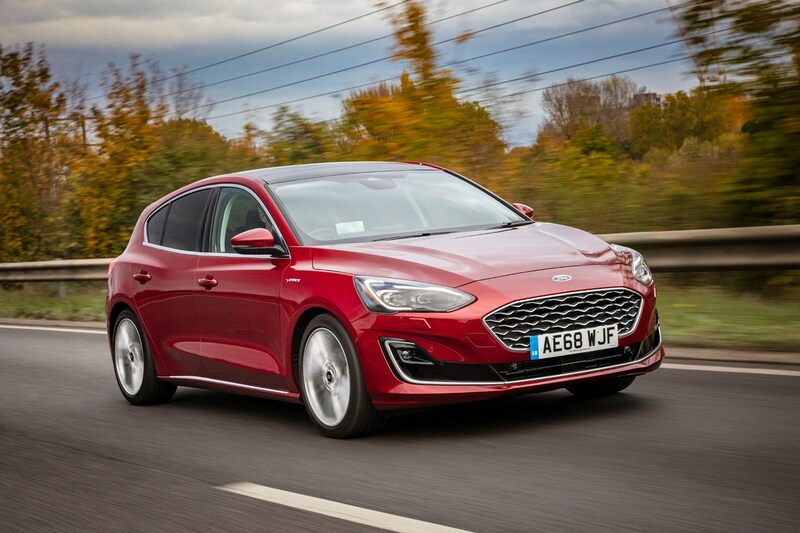 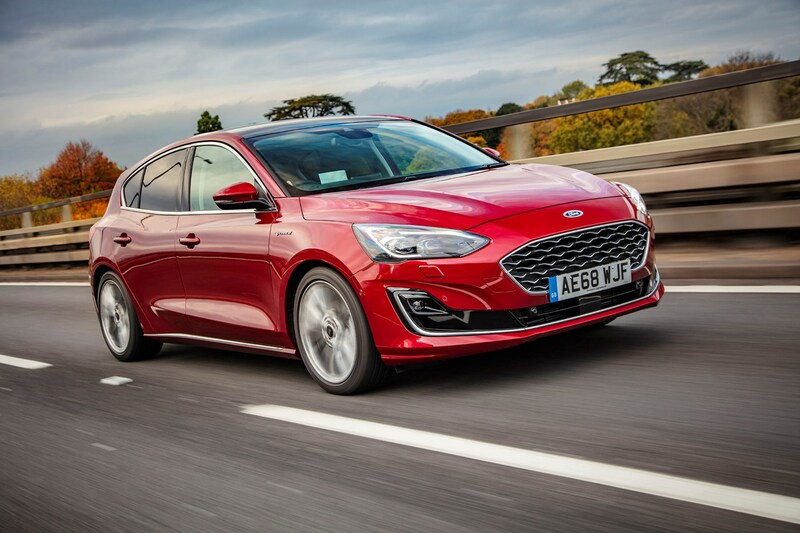 Customers will be spoiled for choice when it comes to picking the engine in their Ford Focus – that is, as long as they weren’t expecting a hybrid option. 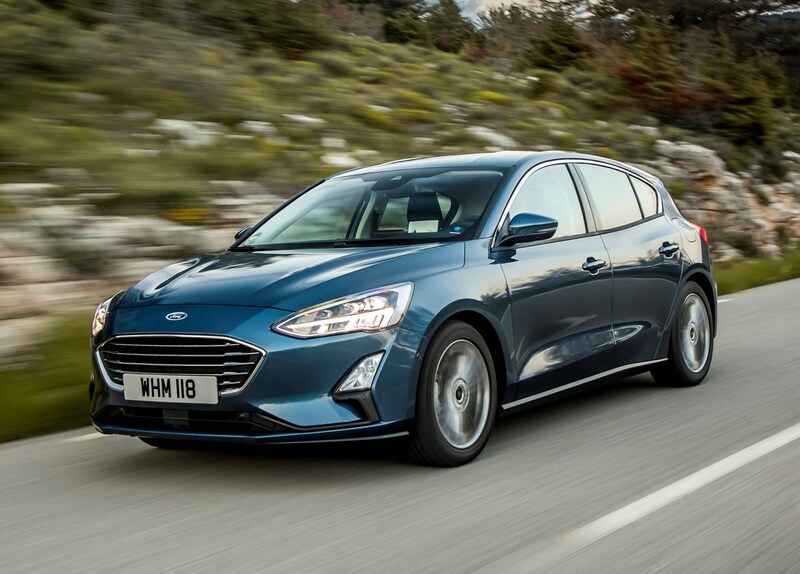 Despite boasting a total of four different engines in eight guises from launch (three of which are diesels), none are hybrid or pure electric. 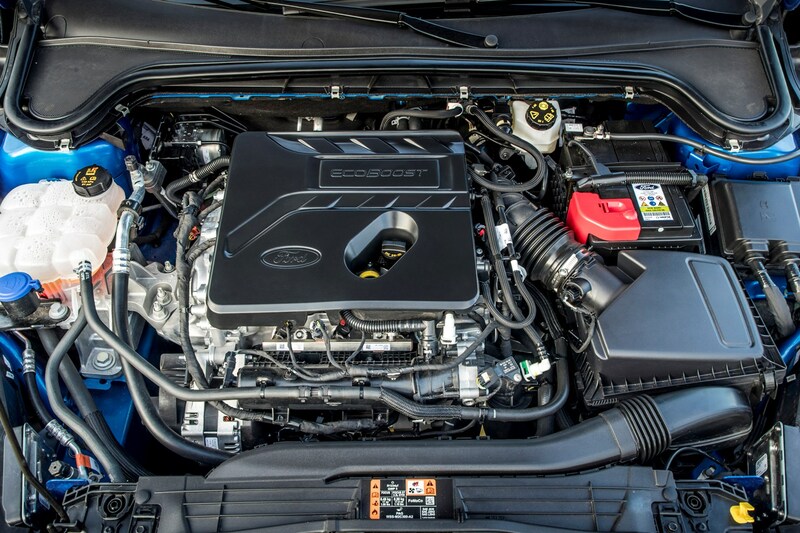 We have been told, however, that all EcoBoost petrol engines are hybrid compatible, so watch this space. 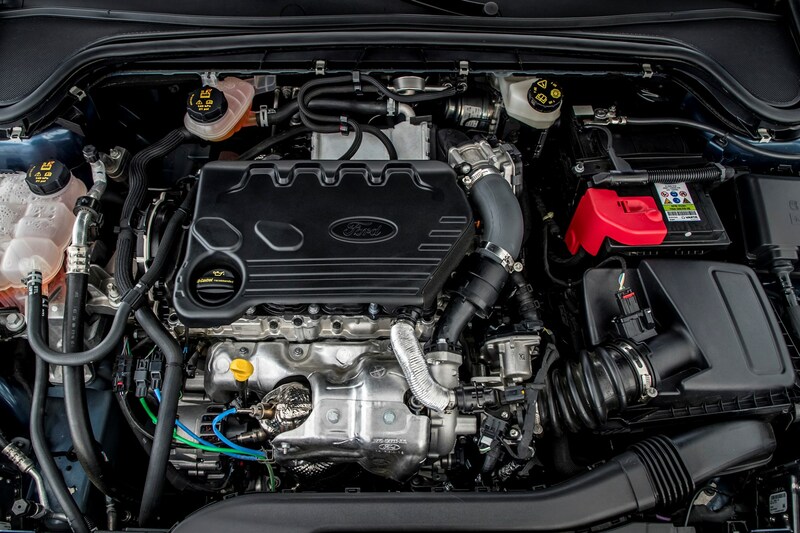 Of the powerplants that you can buy, we’ve driven the 150hp and 182hp 1.5-litre EcoBoost petrols. 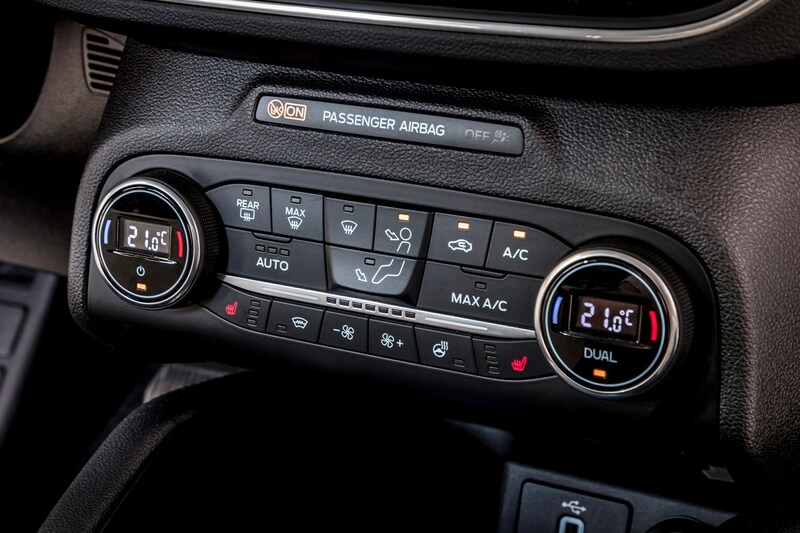 Both are three-cylinder units with cylinder deactivation technology (where the car saves fuel by shutting down one of the three cylinders under light or no throttle) and deliver a smooth, refined driving experience. 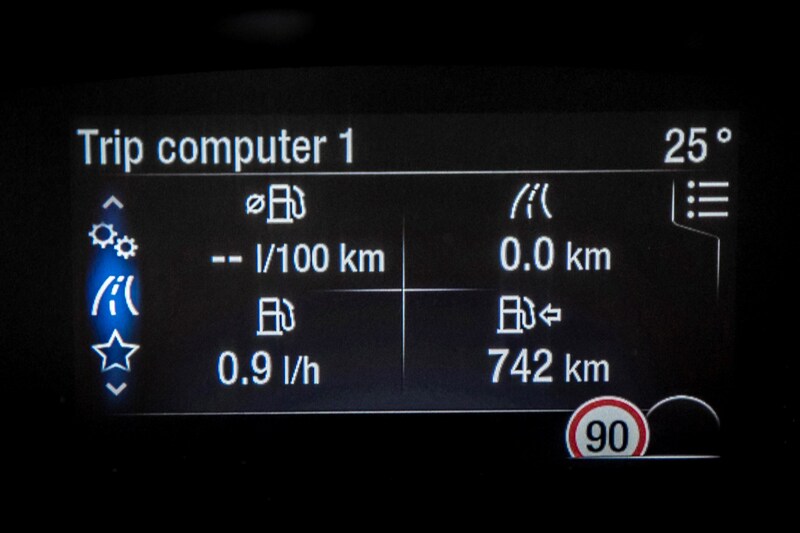 Claimed fuel economy is 51.4mpg for the 150hp unit and 50.4mpg for the 182hp version. 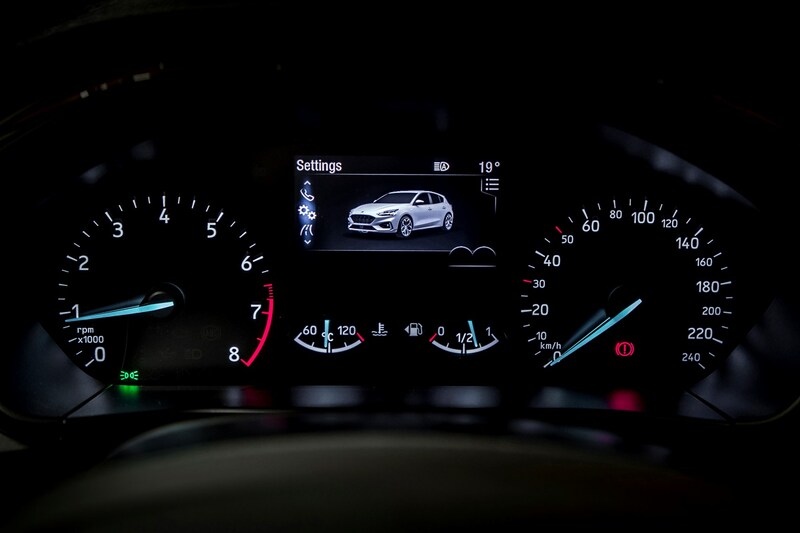 Neither feel particularly quick, but keep an eye on the speedometer and the numbers rise quickly enough for the vast majority of driving situations. 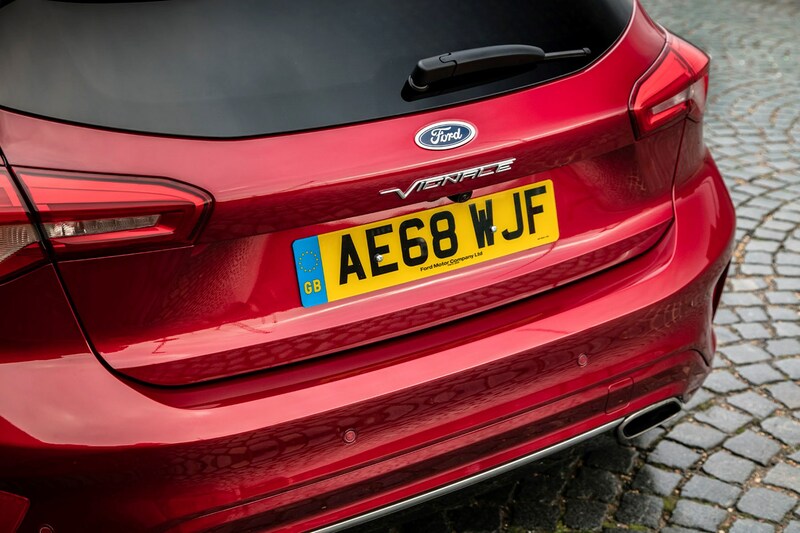 The three-cylinder rumble won’t be for everyone, but you’ll seldom hear it when pottering around at low revs. 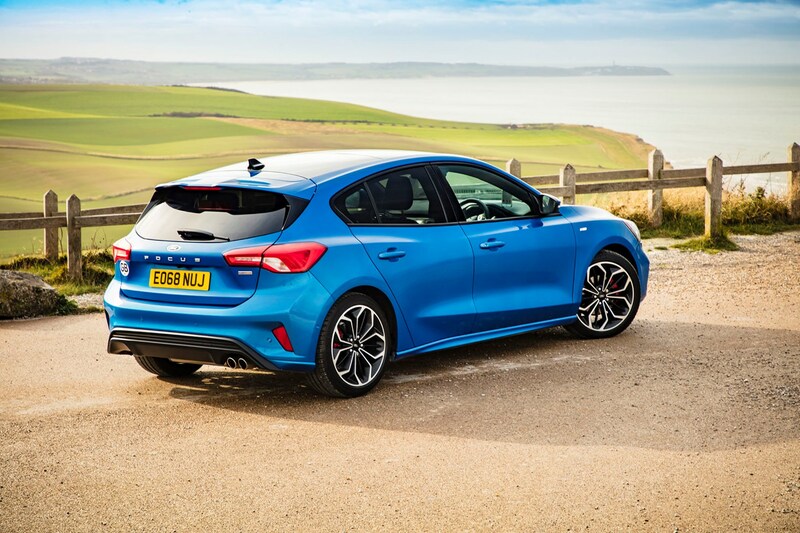 Two new gearbox options are offered – a six-speed manual and an eight-speed auto – yet because the former is such a joy to use it’s hard to justify spending the extra money on the automatic unless you really have to. 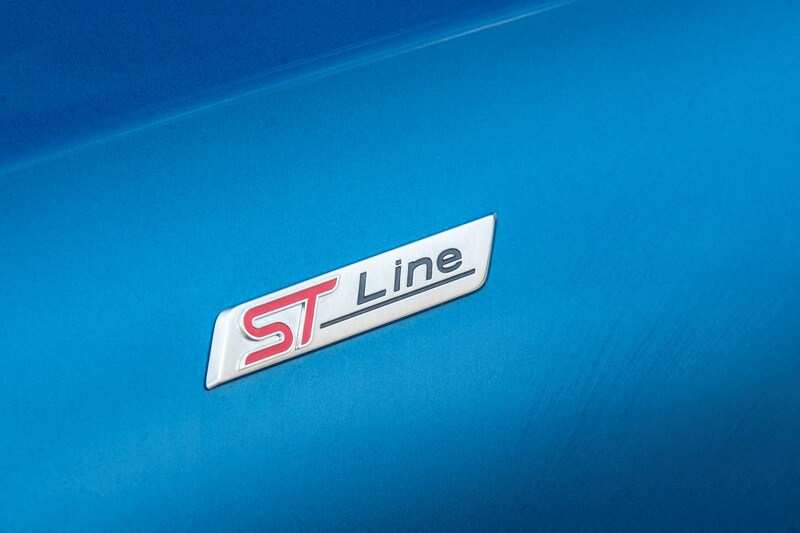 Should you do so, it’s predominantly smooth and predictable, yet can be jerky and inconsistent when hurried. 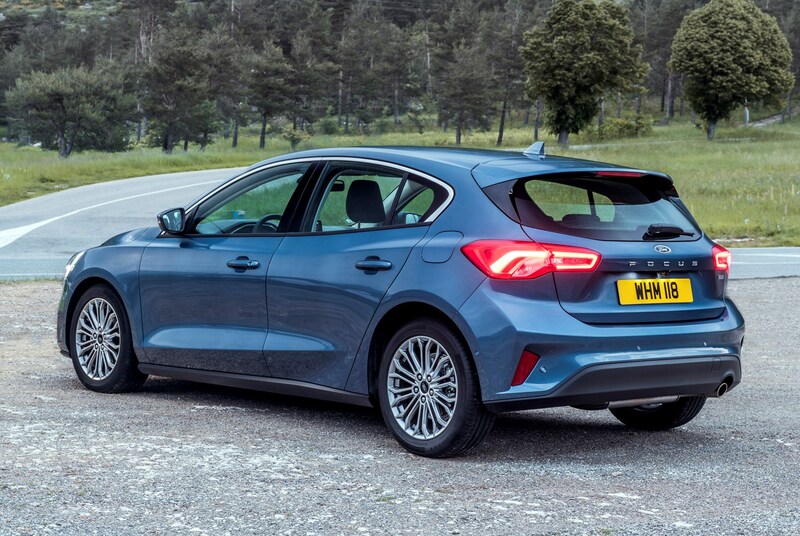 Make no mistake, it’s an improvement over the old Powershift transmissions, but it’s still not quite up there with Volkswagen’s DSG unit. 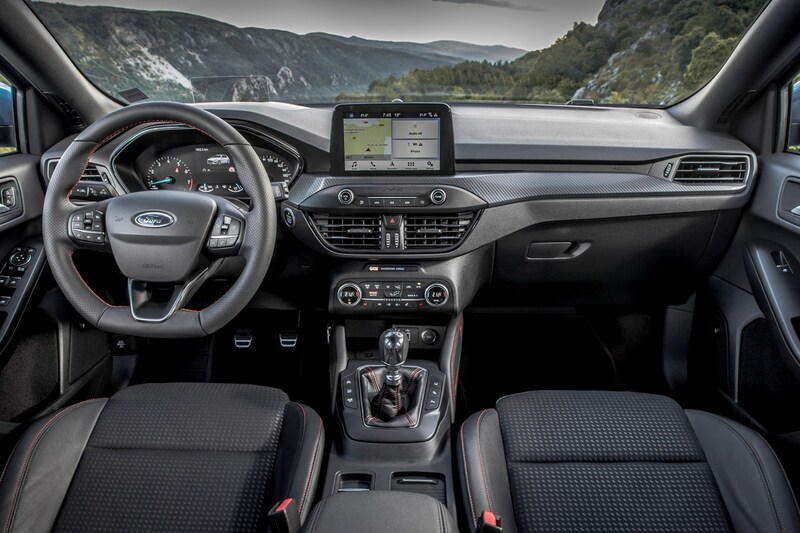 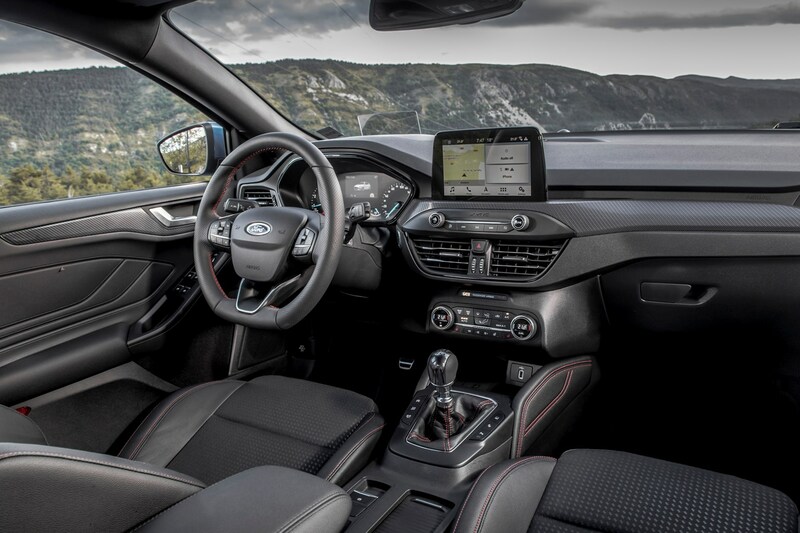 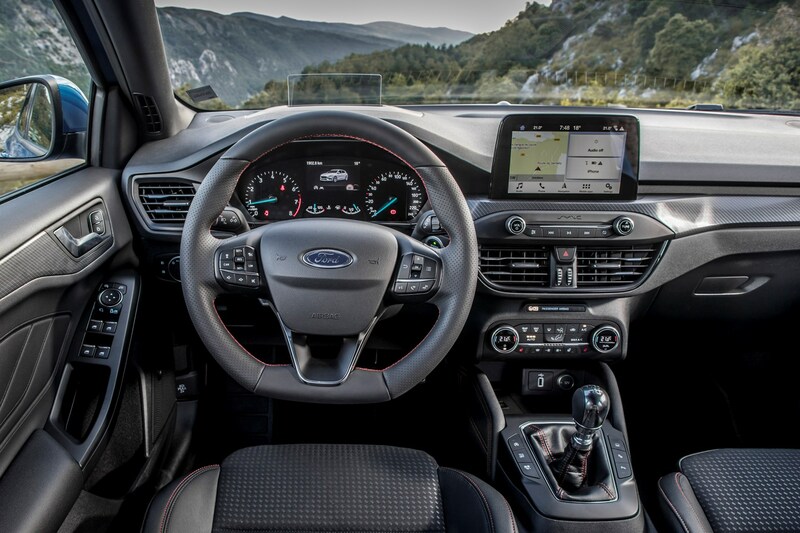 Hop behind the wheel and the overall shape and layout of the cabin isn’t that far removed from the current Fiesta. 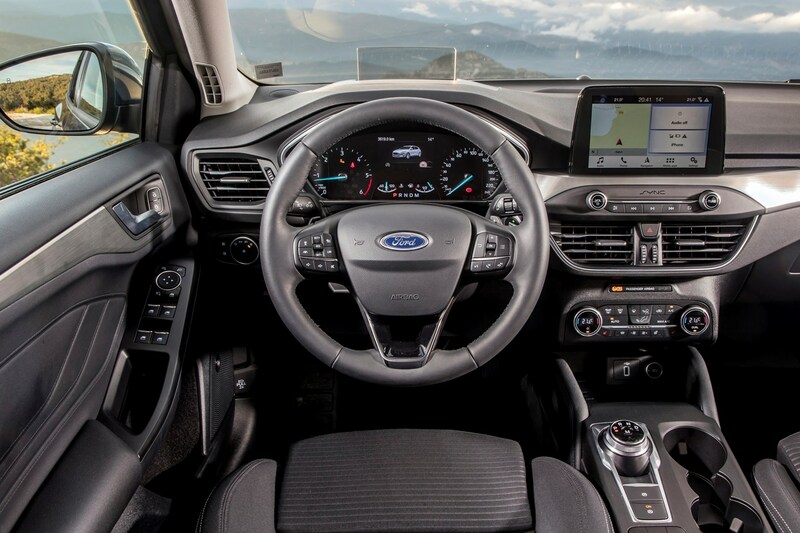 Most of the important controls are positioned logically around the wheel and centre console, while the 6.5-inch touchscreen (an 8.0-inch upgrade is available) juts out of the dashboard to display sat-nav, media and other infotainment options via the tried-and-tested Sync3 interface. 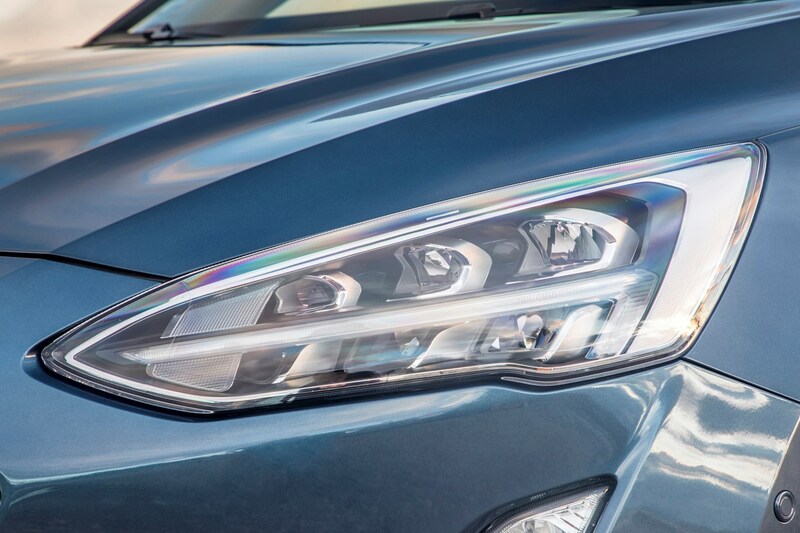 What is new, is the improved perceived quality. 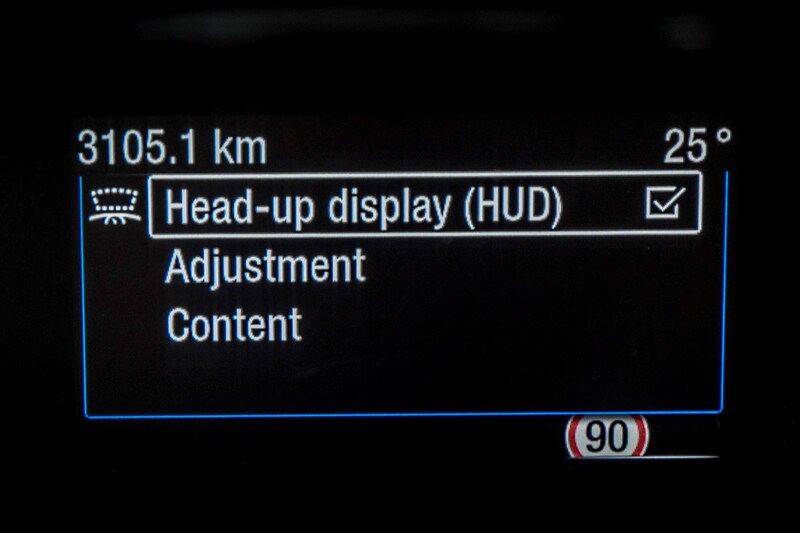 Everything feels tightly screwed together and firmly up-to-date. 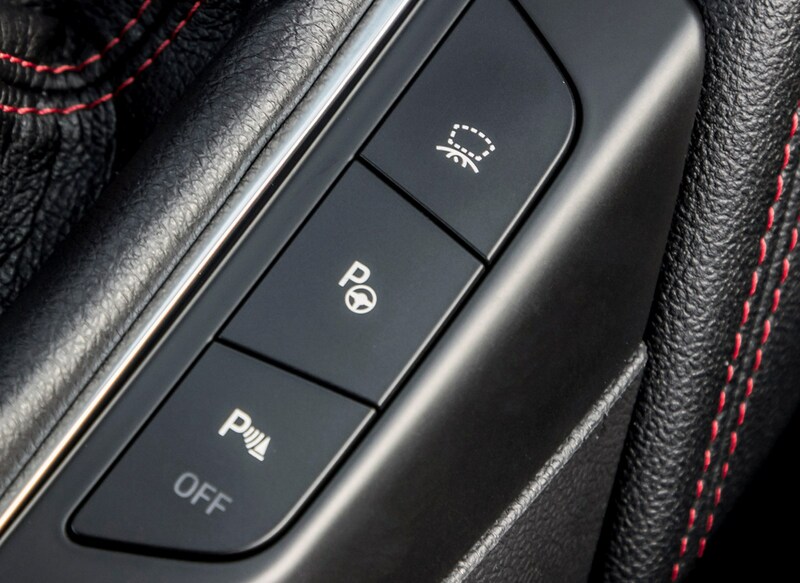 The manual handbrake lever is no more, replaced by an electronic switch, while – on automatic models ­– the traditional gearstick has also bitten the dust with a rotary dial gear selector (like in a Jaguar) taking its place. 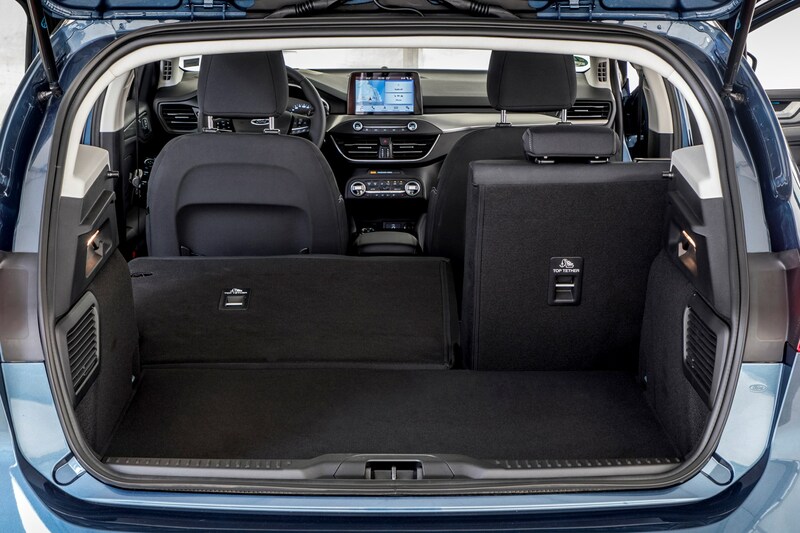 Storage space is reasonable but could be better, with the glovebox and central armrest cubby feeling a little pinched. 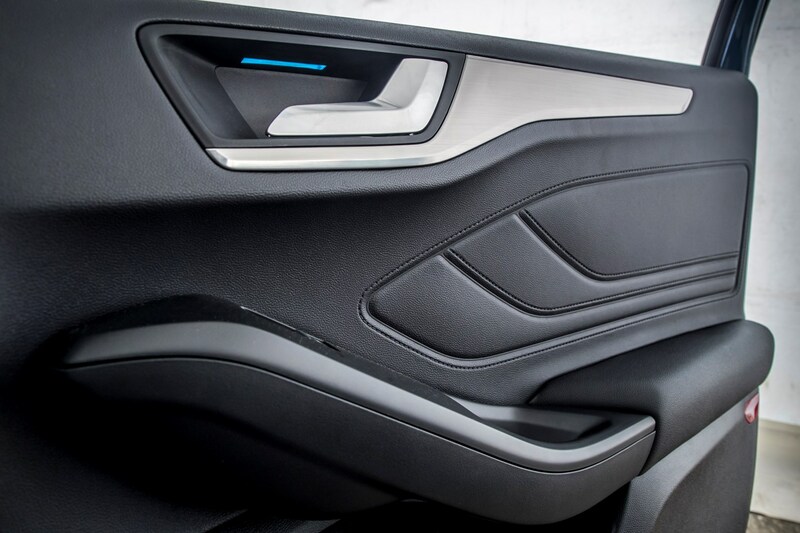 Still, deceptively large door pockets and well-placed central cupholders go some way to making up for it. 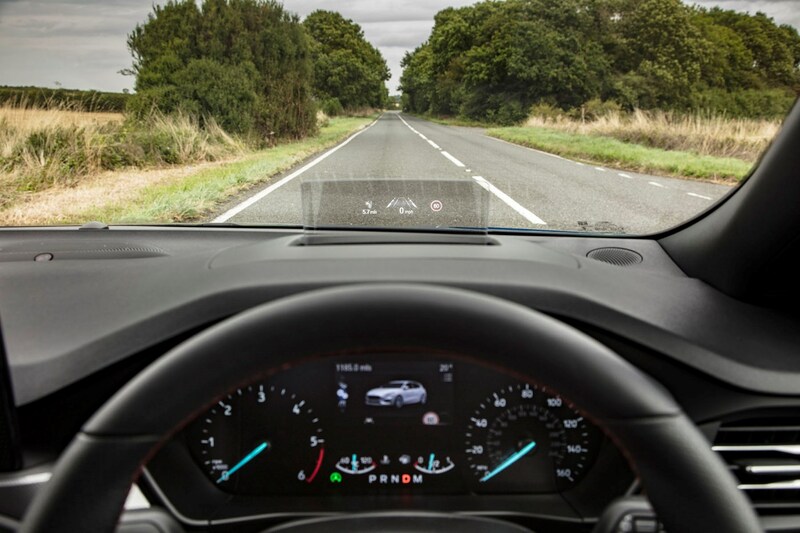 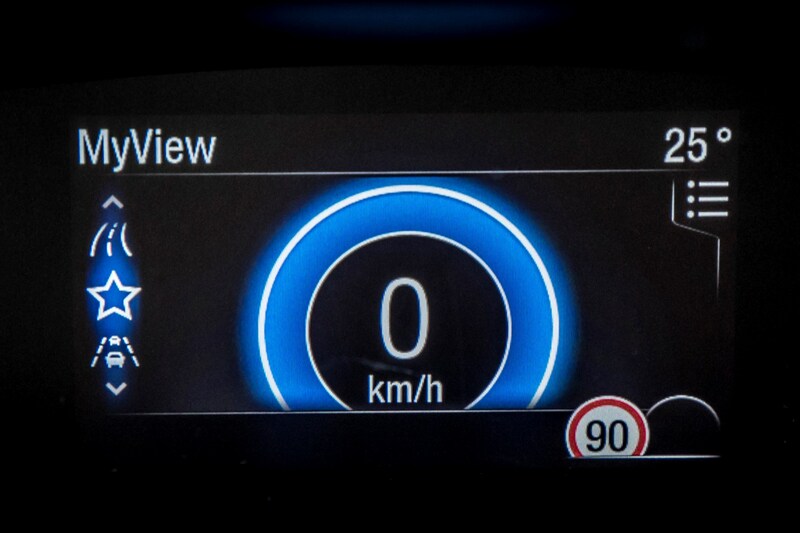 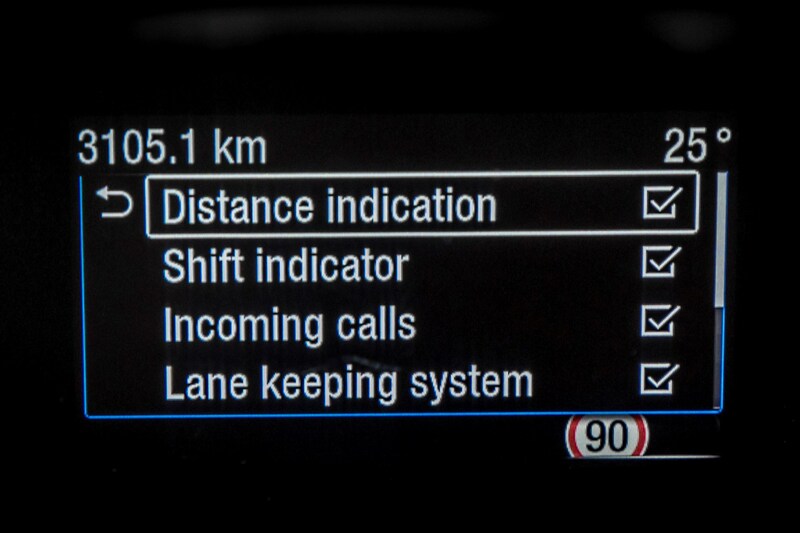 An optional head-up display also makes its debut on Ford cars in Europe, and is capable of showing speed, traffic sign and sat-nav instructions. 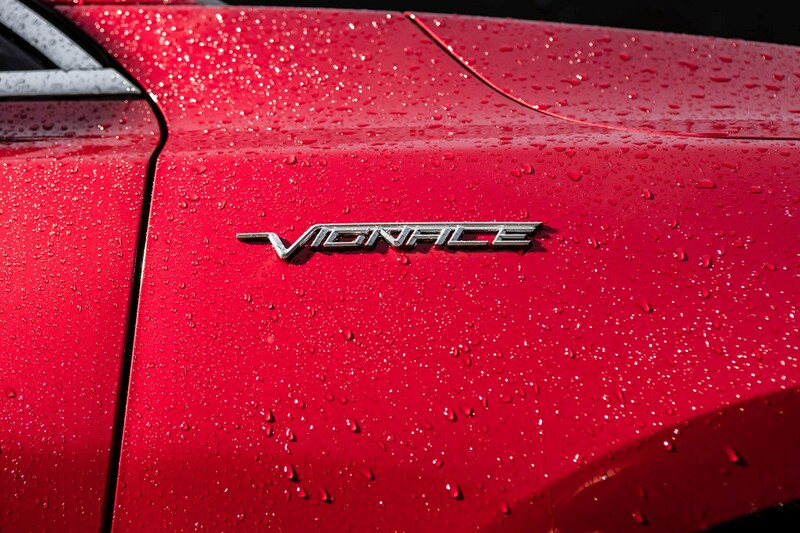 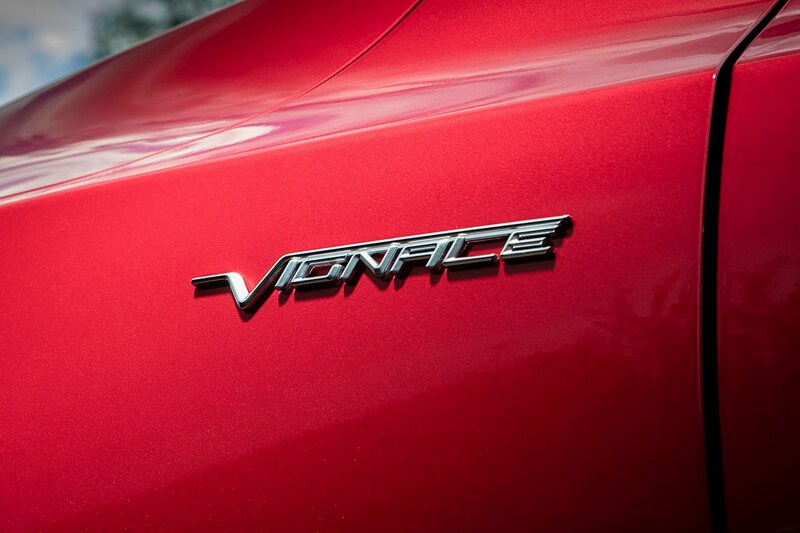 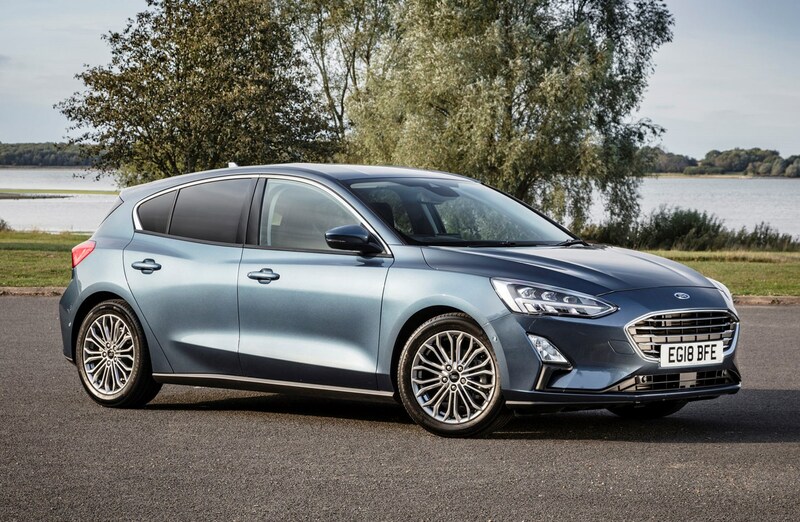 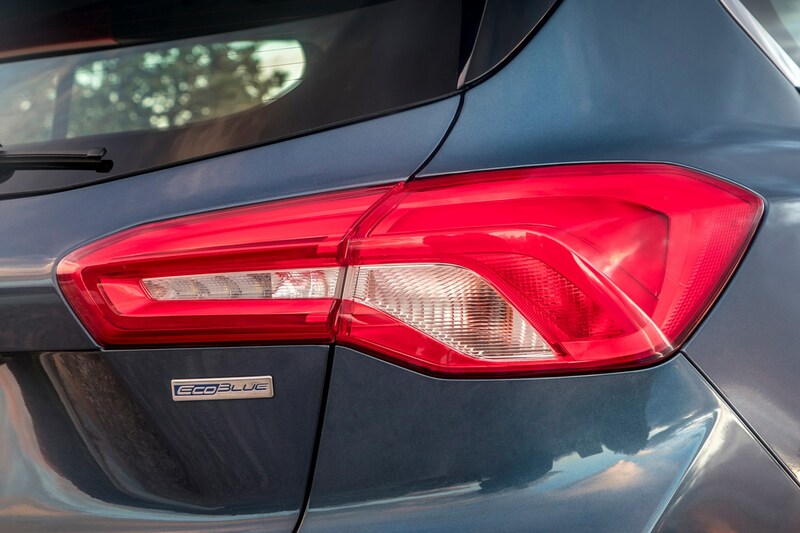 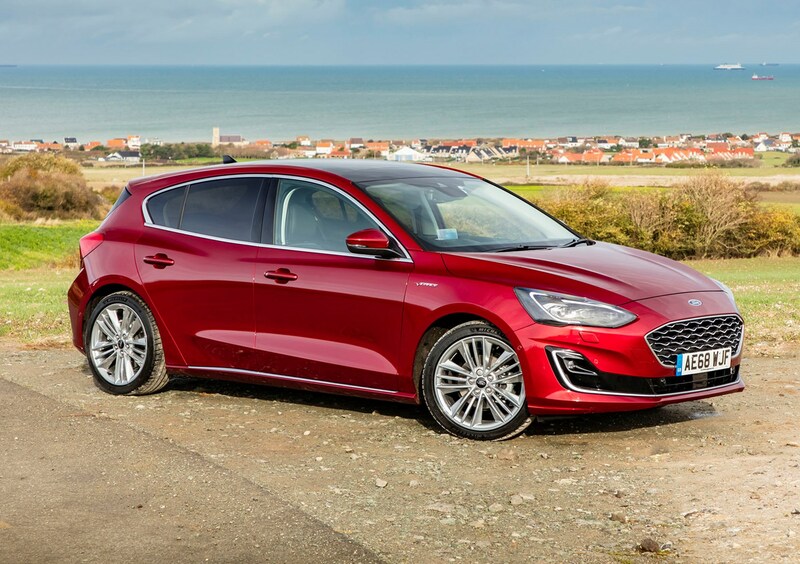 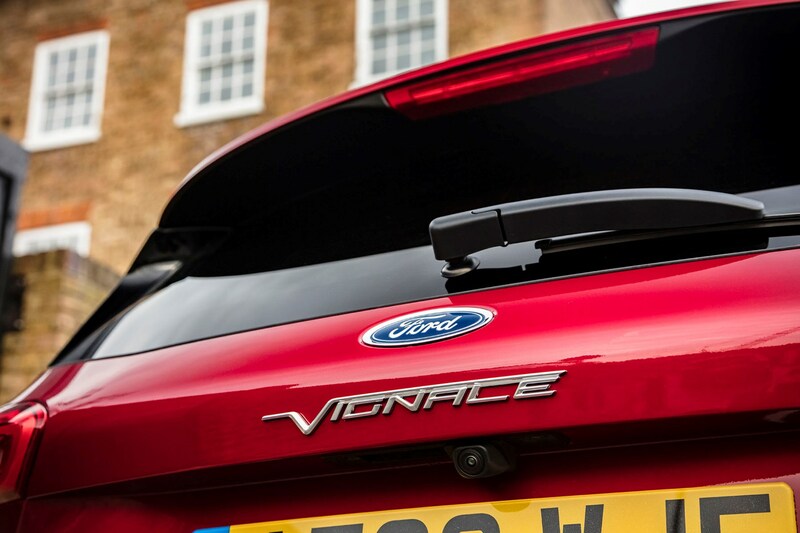 The familiar trim levels – including popular Zetec and Titanium – remain, joined by the new top-of-the-range luxury Vignale spec. 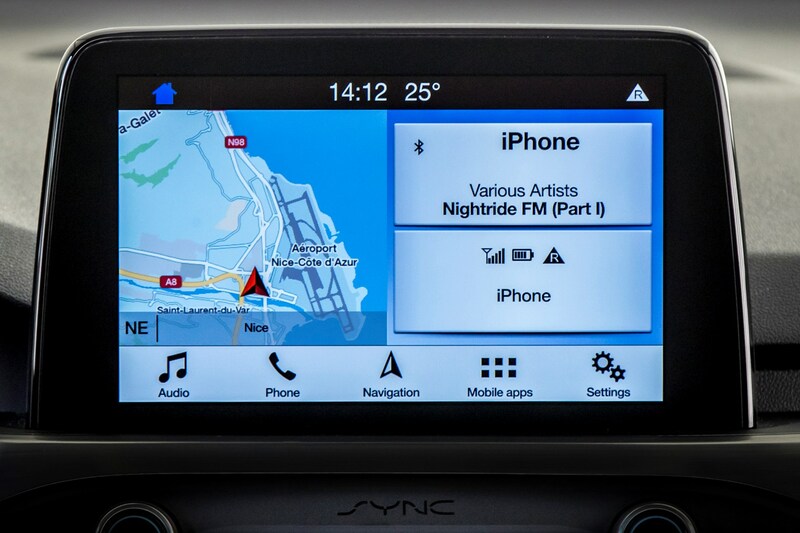 Standard equipment on Style models is fairly sparse, but still includes air-con, DAB radio and switchable drive modes. 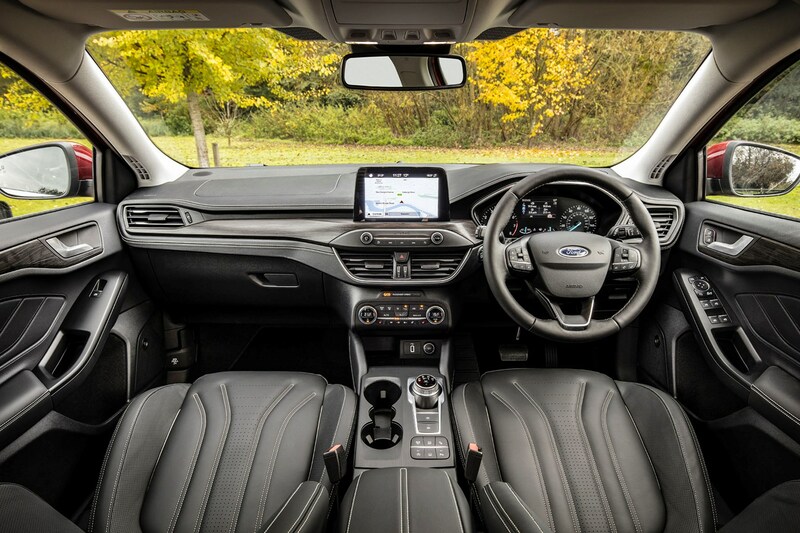 Upgrade to Zetec trim for the useful Quickclear heated windscreen, cruise control and Sync3 touchscreen infotainment system plus Apple CarPlay and Android Auto compatibility. 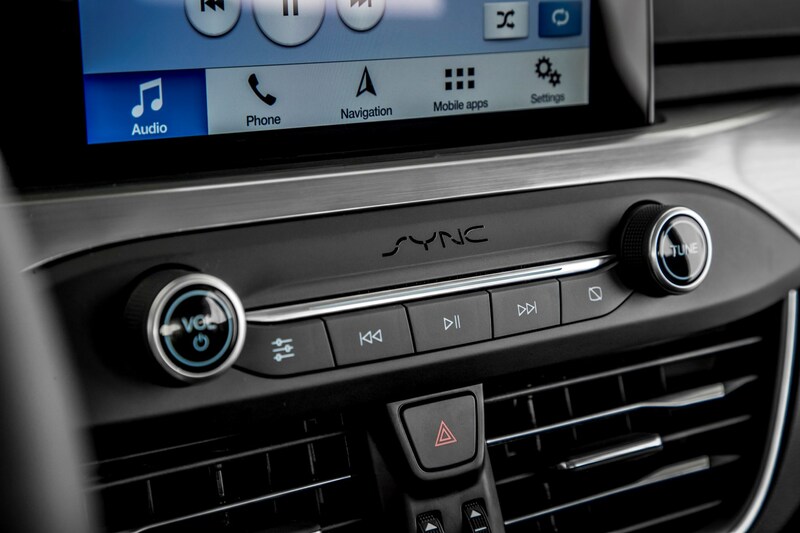 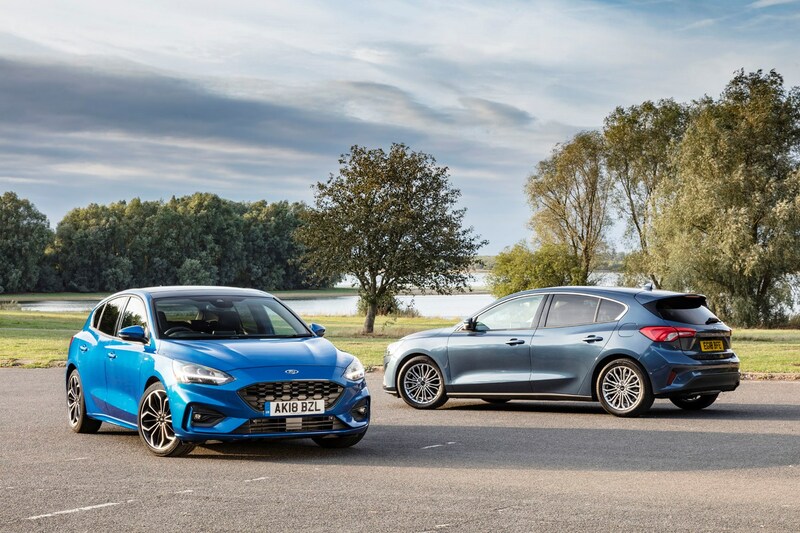 Ford appears to have thrown much of the Focus’ development budget on technology designed to make the driver’s experience behind the wheel safer and more relaxing. 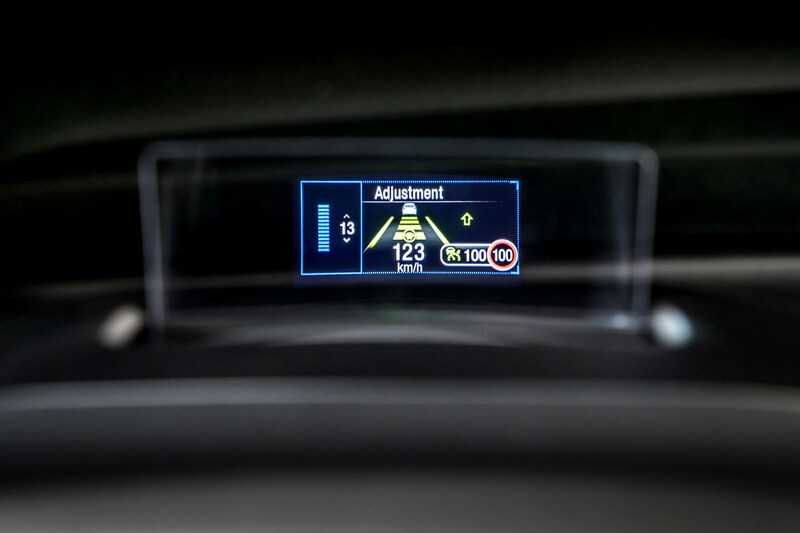 Adaptive cruise control returns, yet now features Stop & Go capability, which, in combination with Lane-Centring, takes care of the steering, brakes and throttle inputs in a traffic jam. 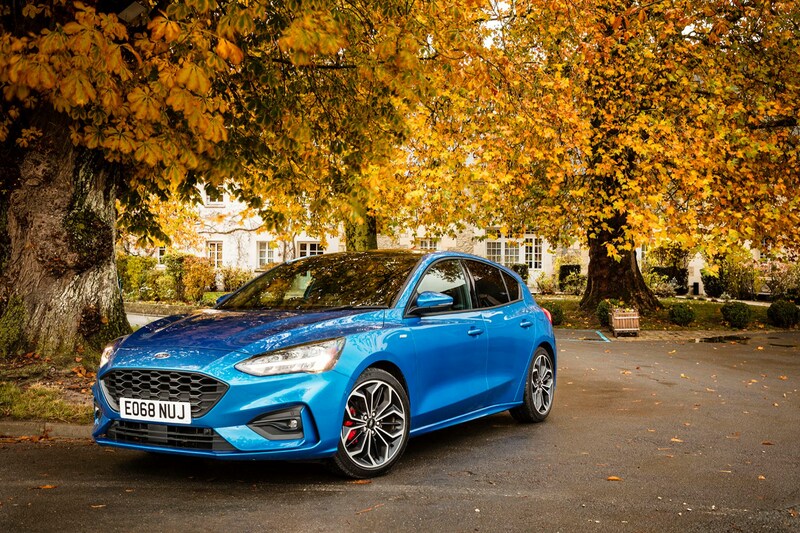 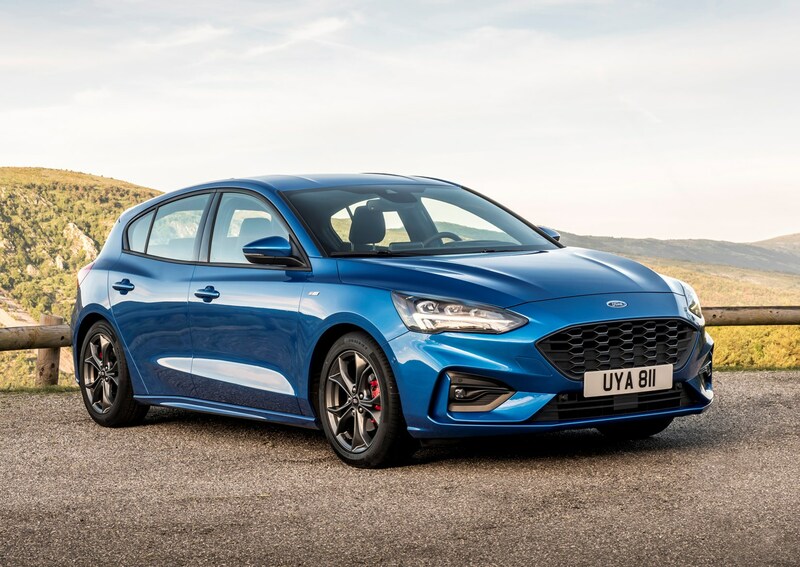 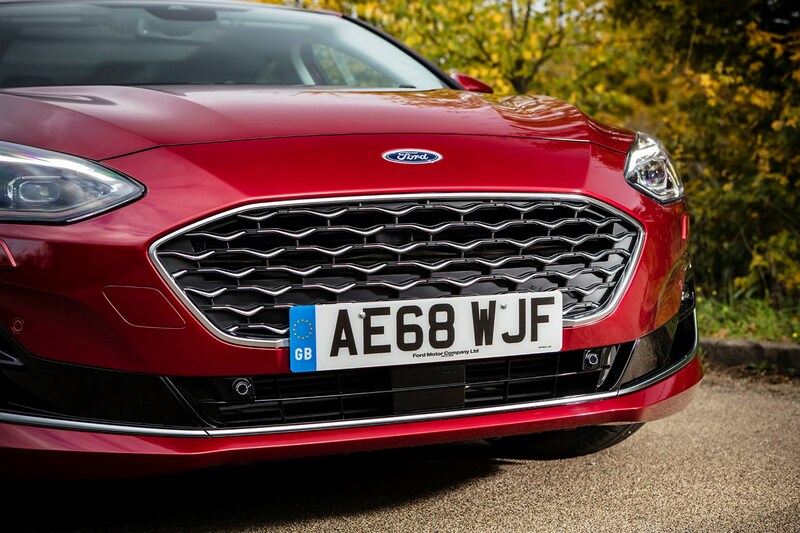 Those technologies, together with the strength of the Focus's structure, ensured it received a full five-star crash test rating from Euro NCAP when it was tested in summer 2018. 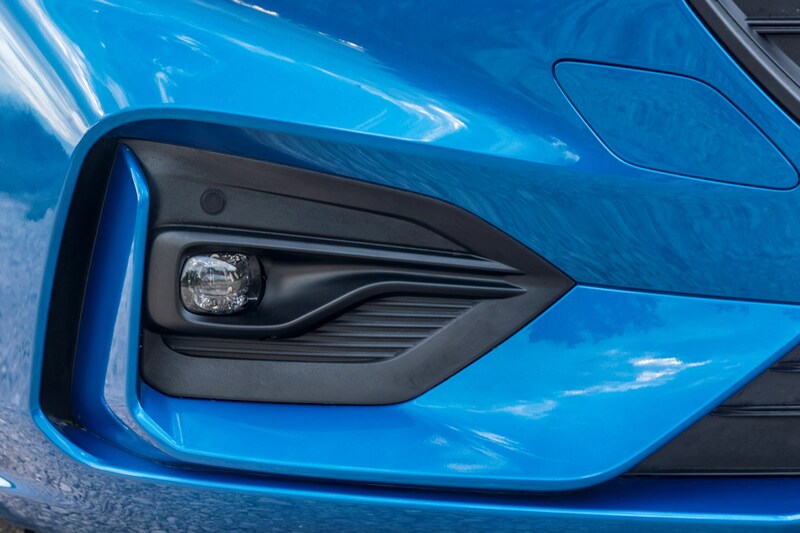 Adaptive front lighting with Predictive Curve Light and Sign-based Light is also available and works by pre-adjusting the vehicle’s headlamp patterns to improve visibility by monitoring bends in the road and traffic signs. 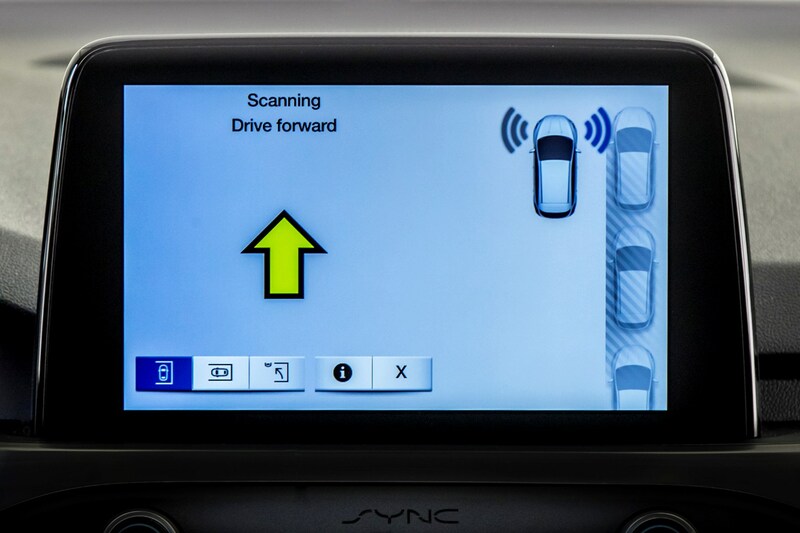 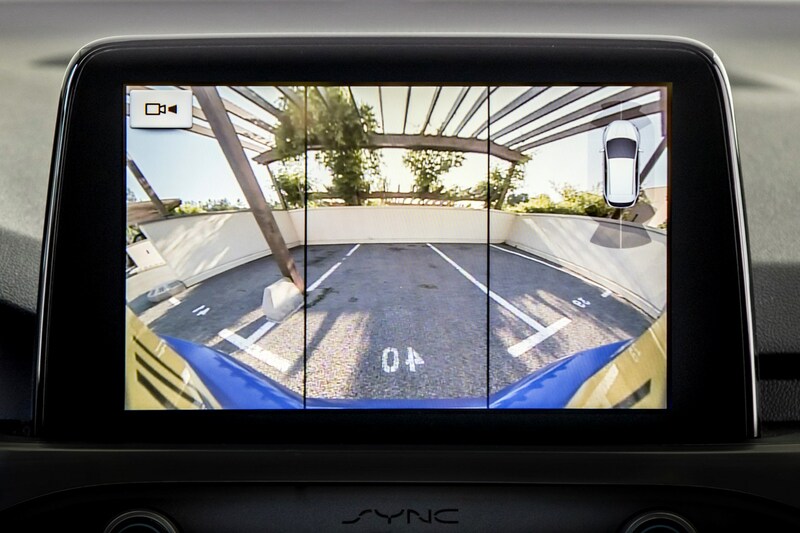 Meanwhile, Active Park Assist 2 enables automatic parking (manual transmission models get regular Active Park Assist), while Evasive Steering Assist helps drivers steer around parked (or slower) vehicles that they may have not seen. 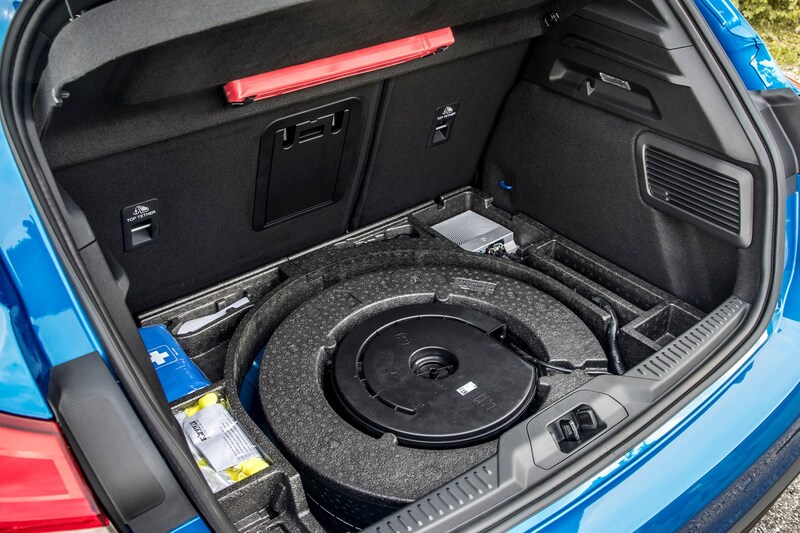 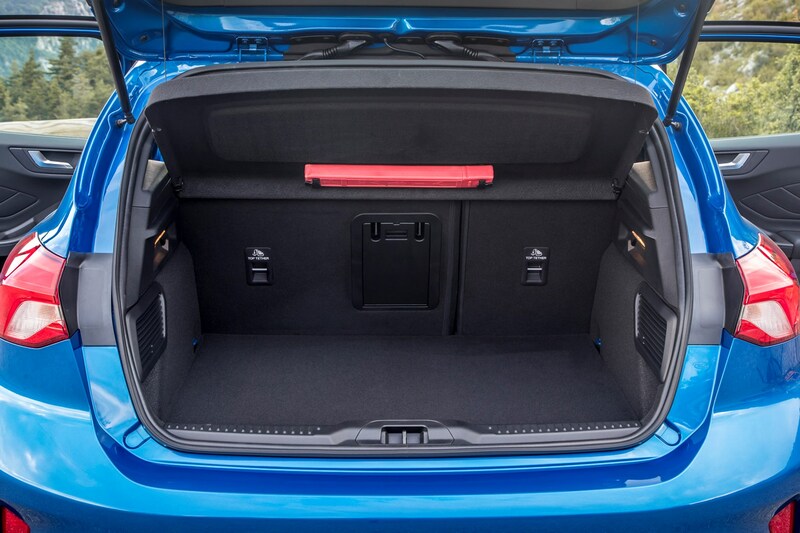 Providing a well-shaped 375-litre boot with the rear seats in place (rising to 1,354 litres with them folded down) the Focus beats the Volkswagen Golf for outright capacity. 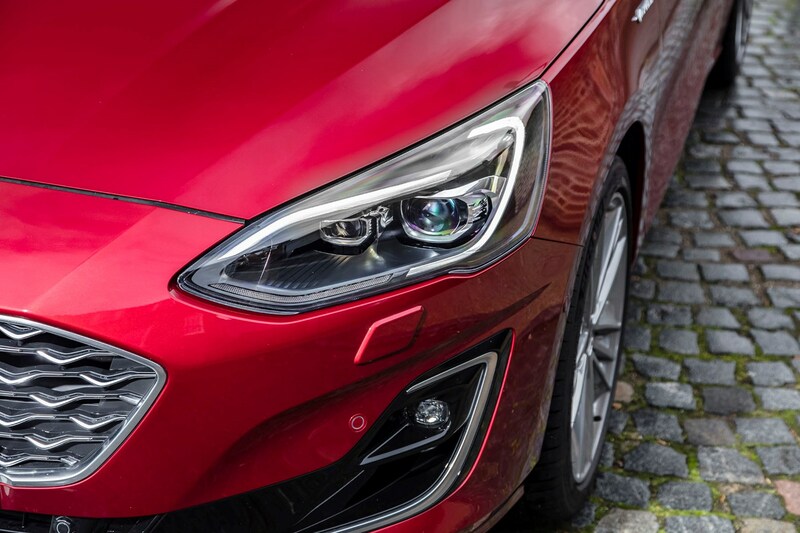 A slight loading lip could make loading heavy items a little tricky, but there’s little else to complain about. 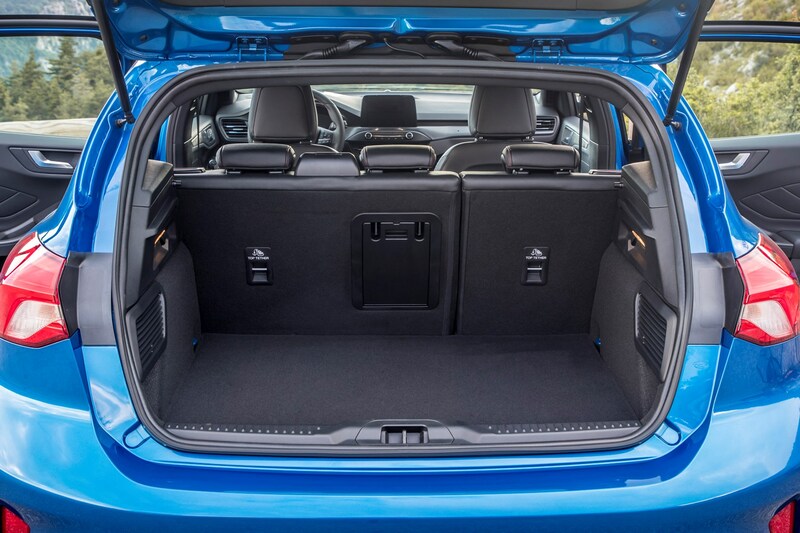 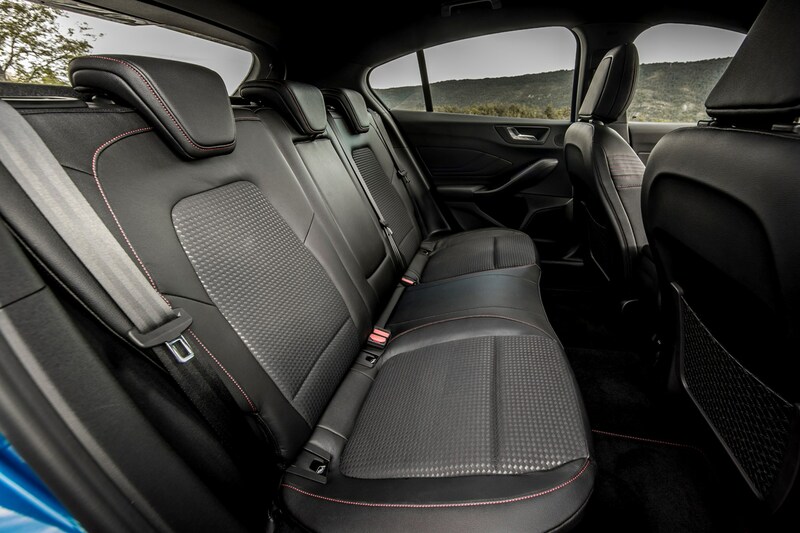 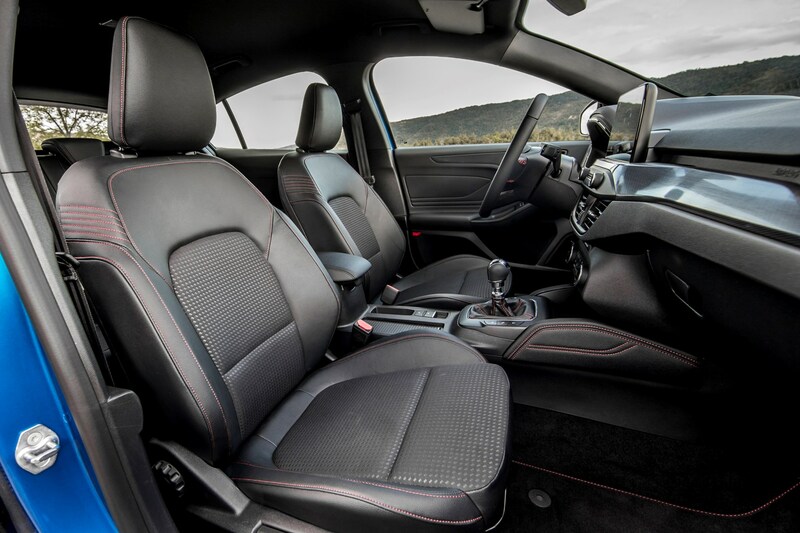 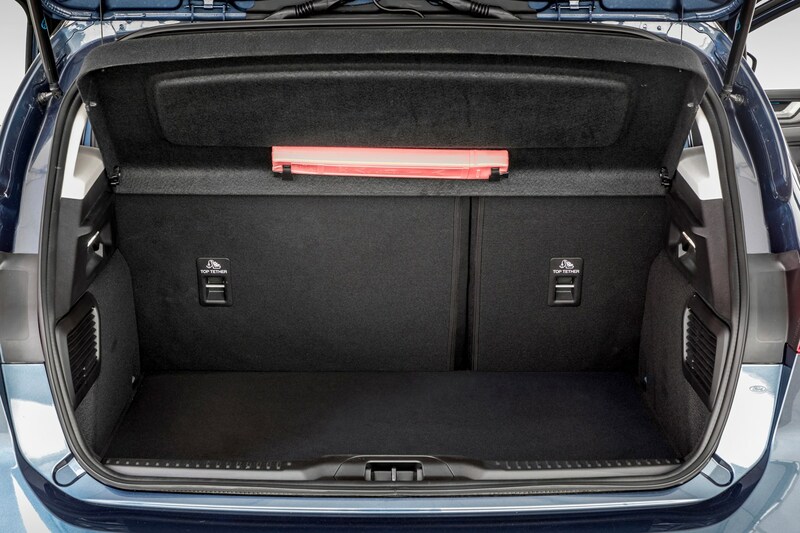 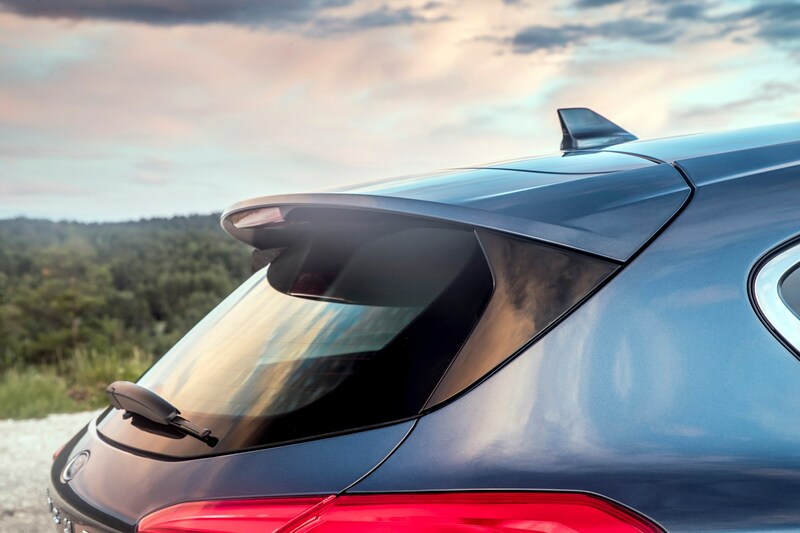 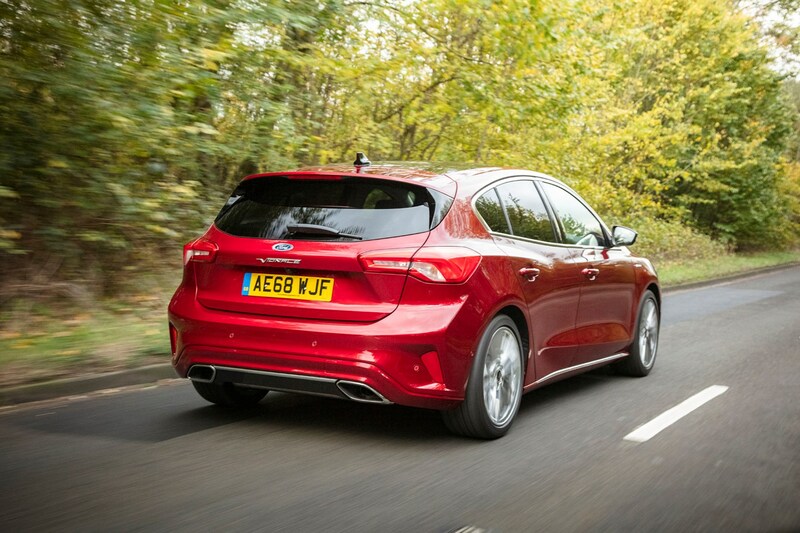 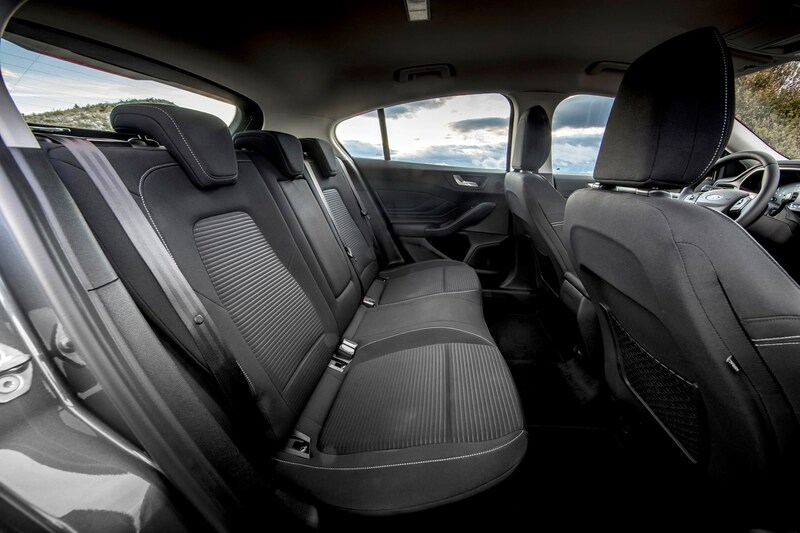 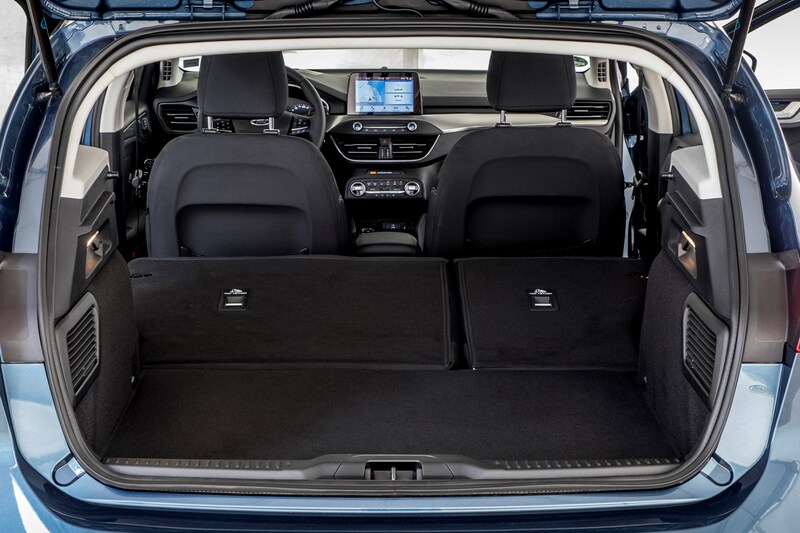 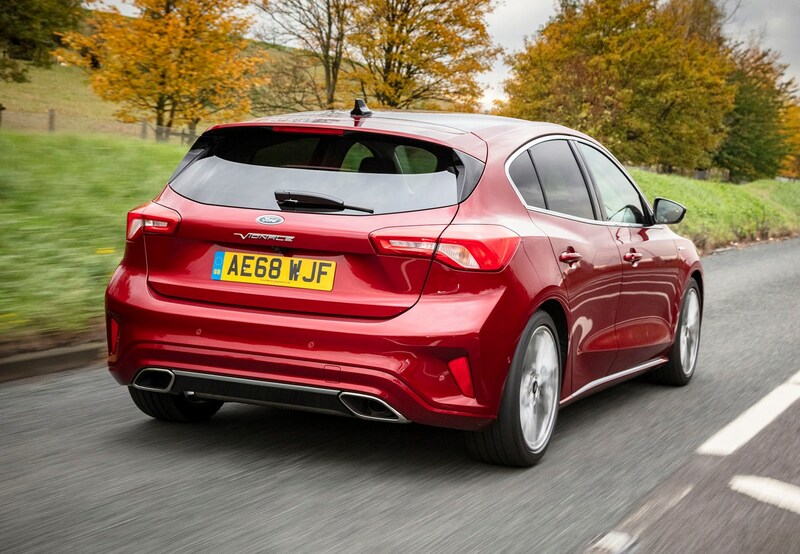 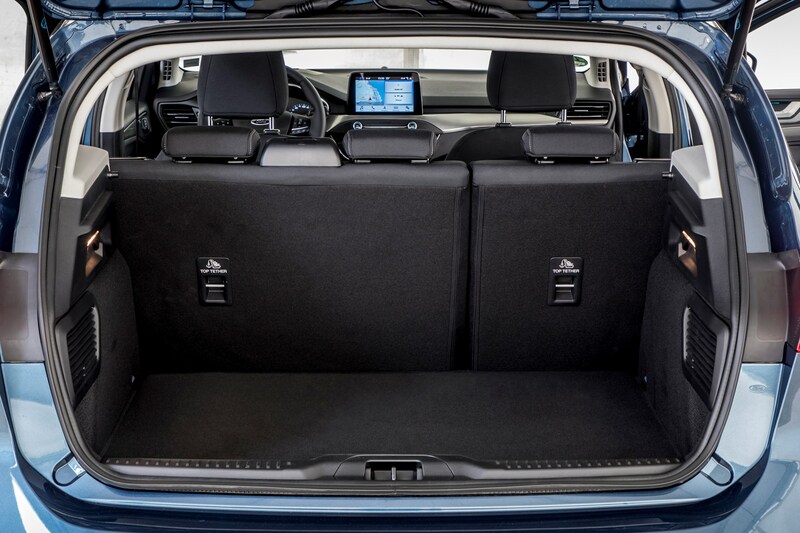 Spacious boot aside, it’s in the rear seats where the Focus shows off one of its strongest assets. 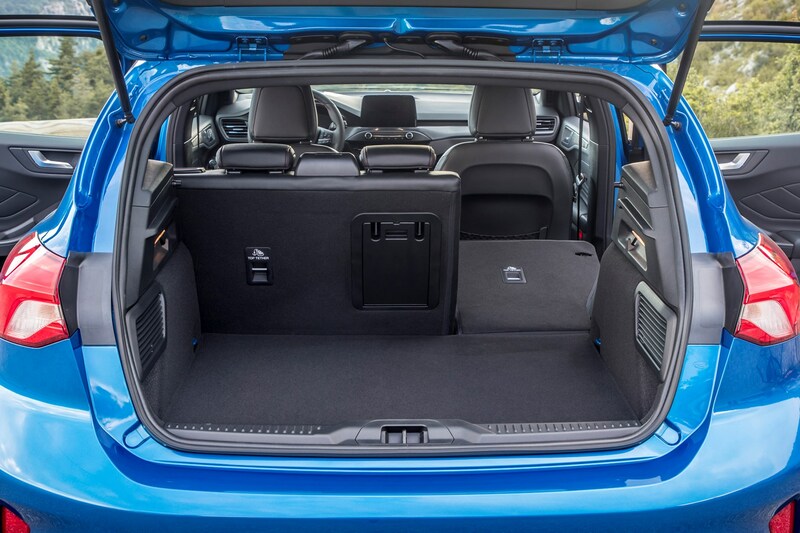 Thanks to a longer wheelbase, there’s 50mm extra legroom and 60mm extra shoulder room over the previous model – and it certainly shows. 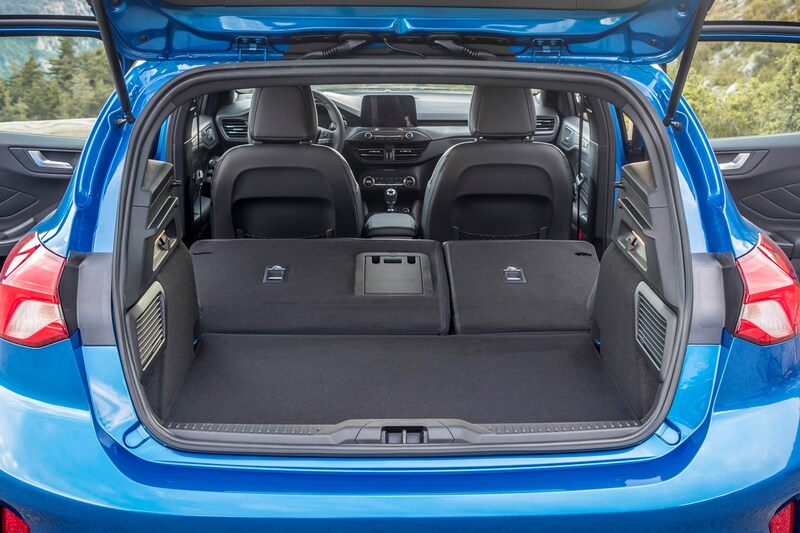 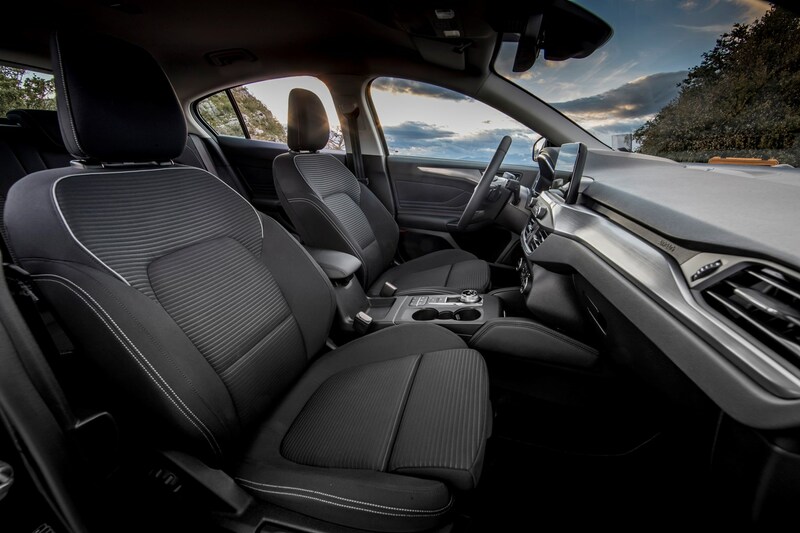 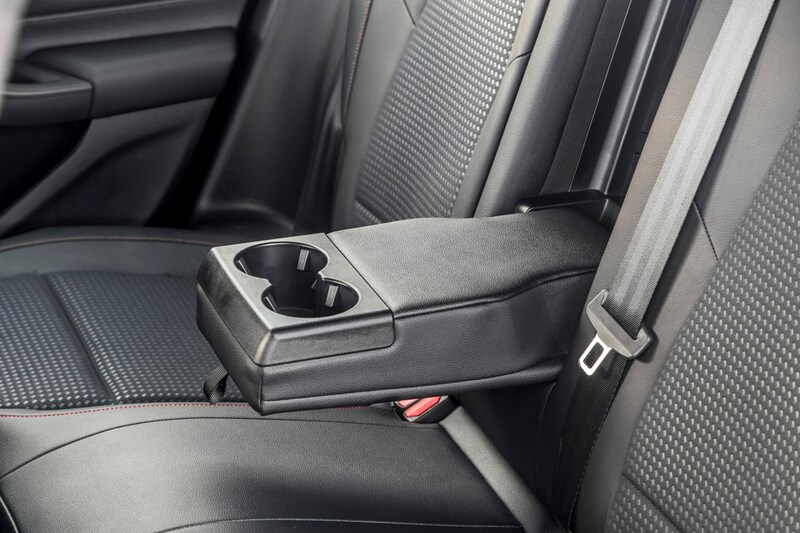 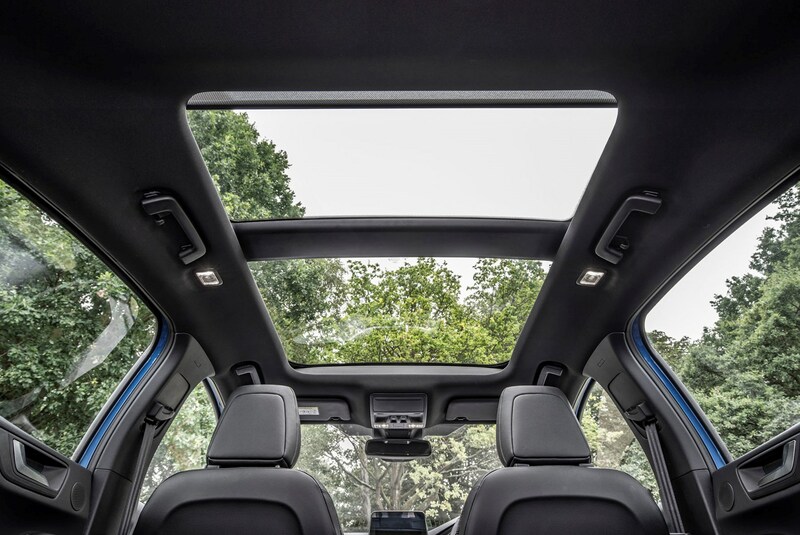 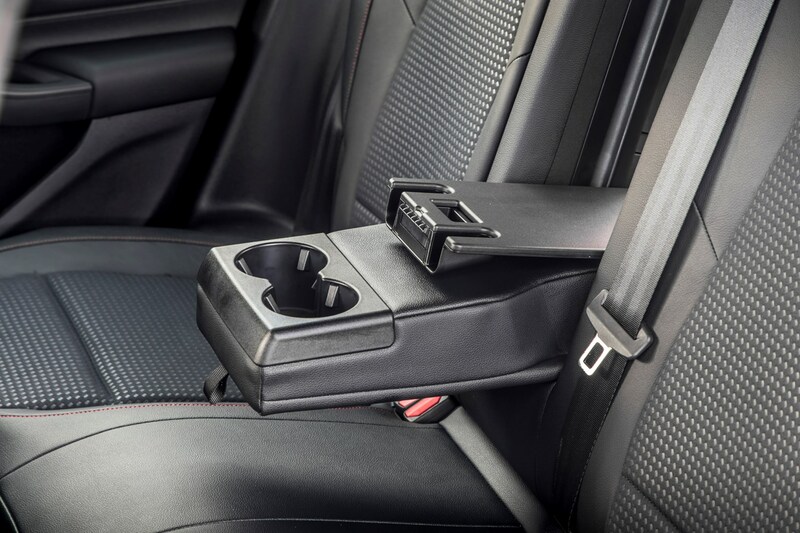 An average-sized adult will have no trouble getting comfortable in the back, plus, thanks to a relatively flat floor, using the middle seat is actually a viable option. 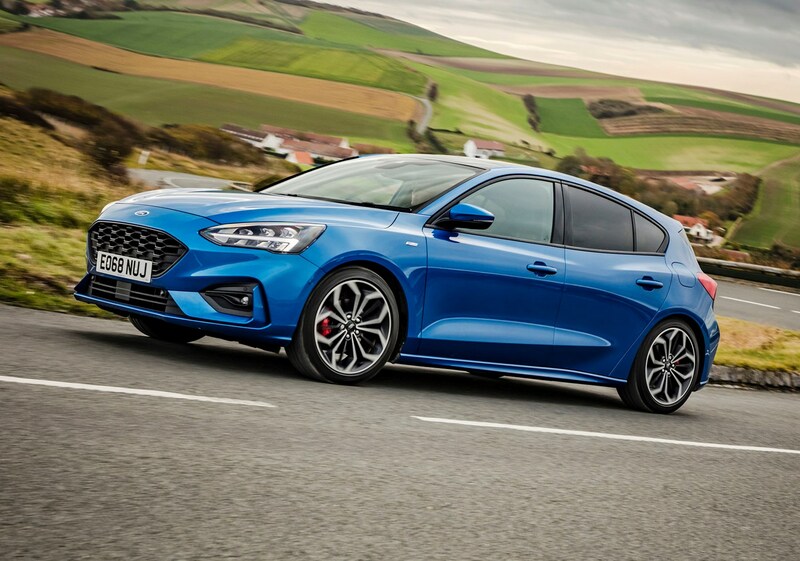 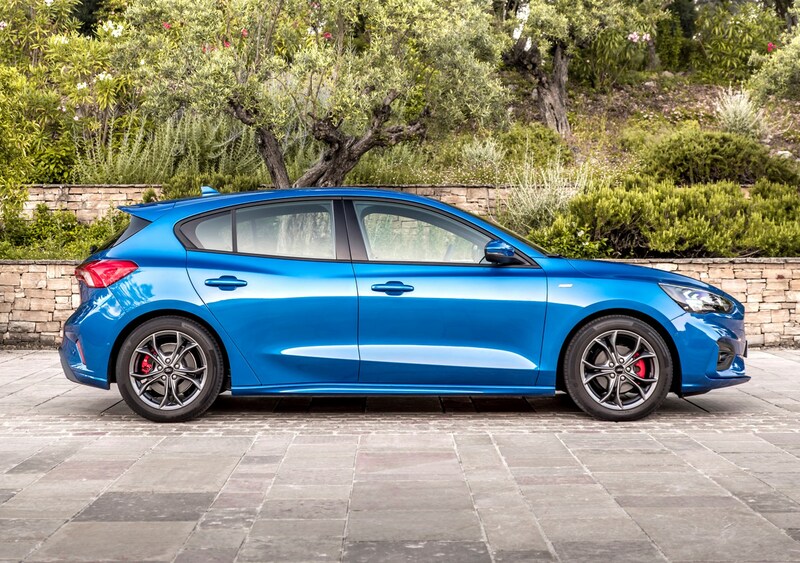 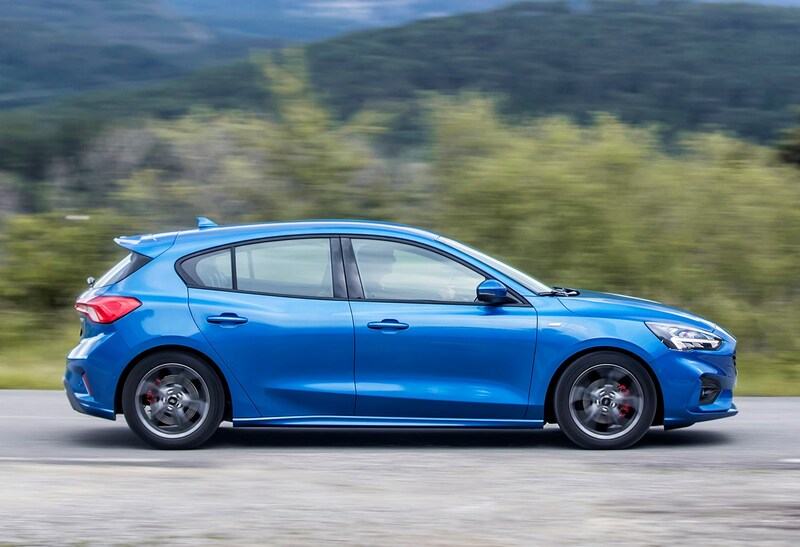 Will there be an RS to join the 2019 Focus ST? 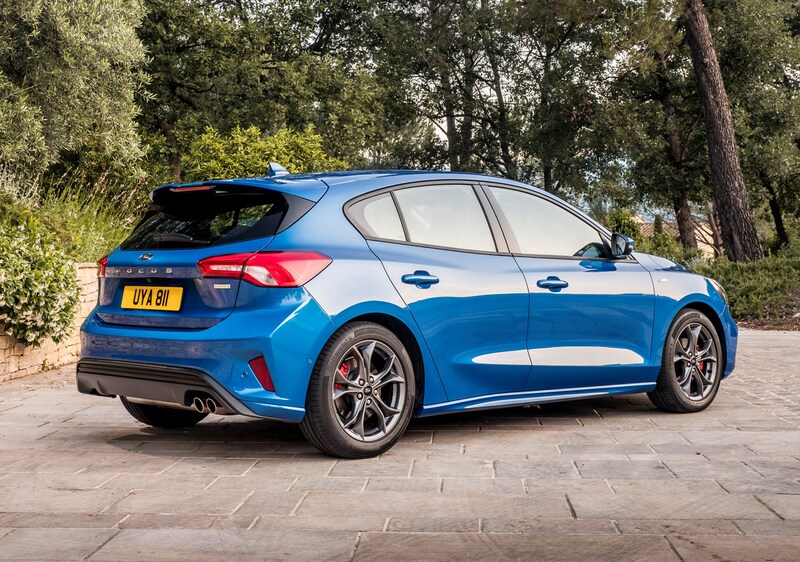 Nothing has been confirmed yet, but strong rumours of a 2020 Focus RS aren’t likely to be wide of the mark, and with the ST coming out of the blocks with 276hp to play with, it's going to need 350hp-plus to make sure it's worth the upgrade. 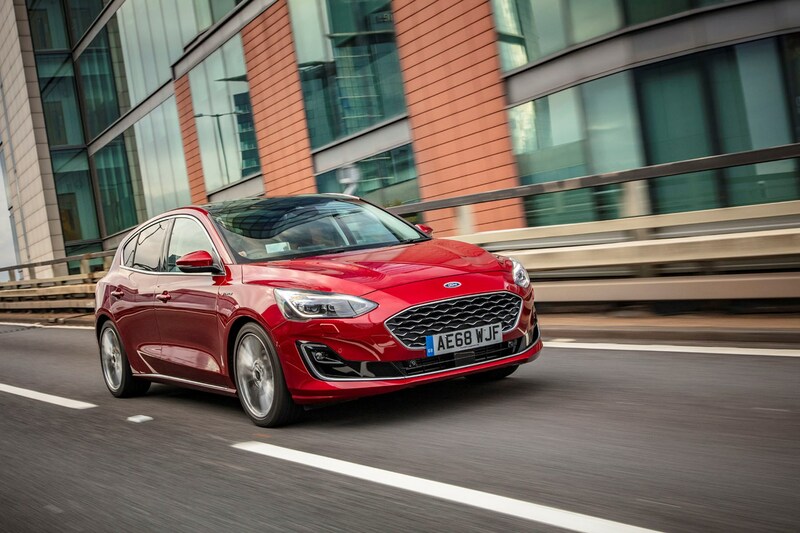 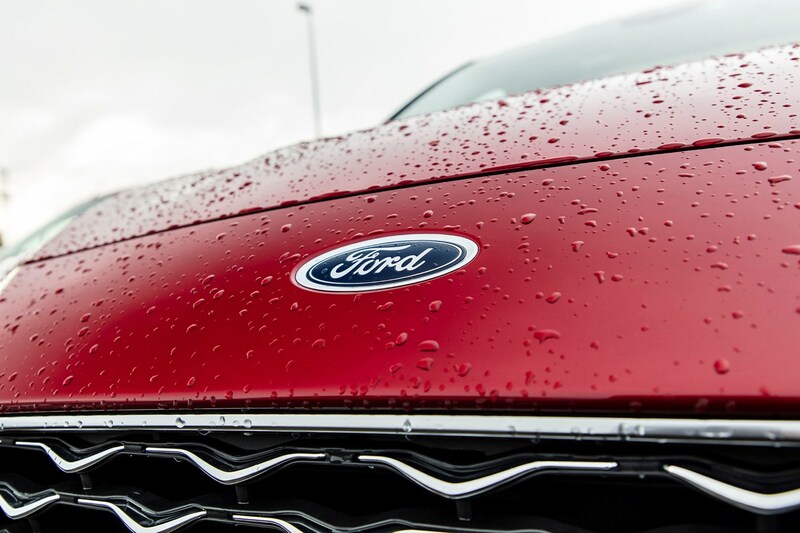 Should you buy a Ford Focus? 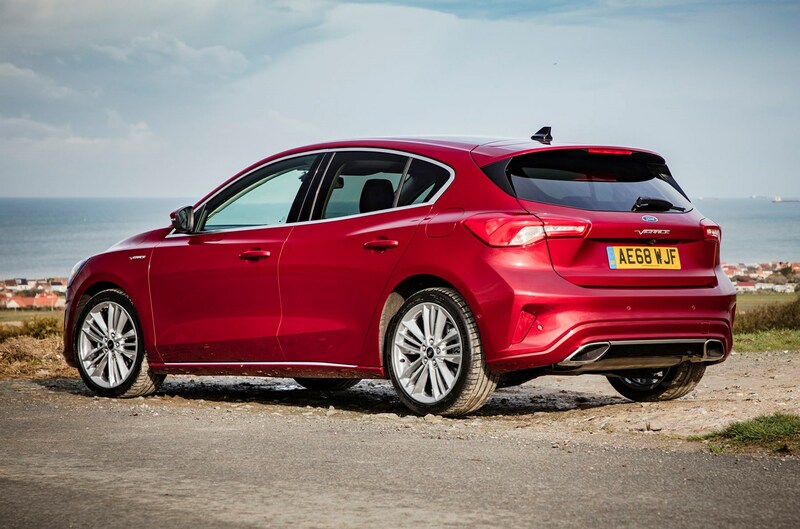 The humble Ford Focus is better than ever. 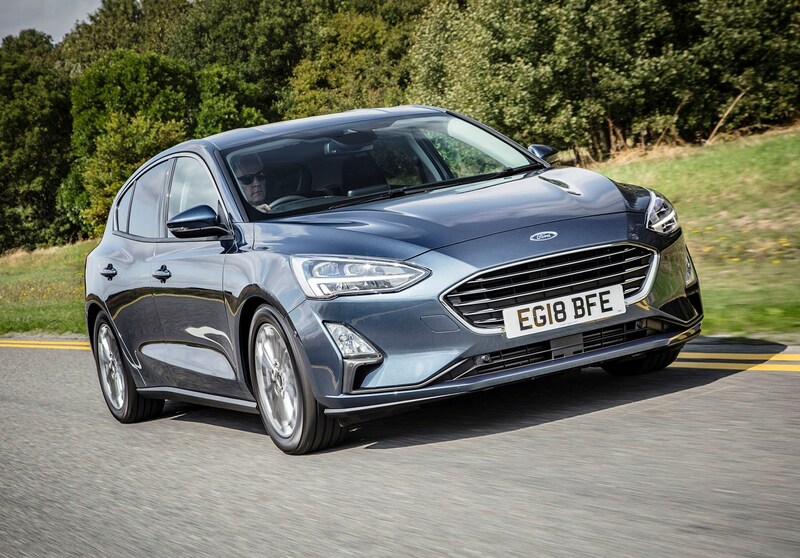 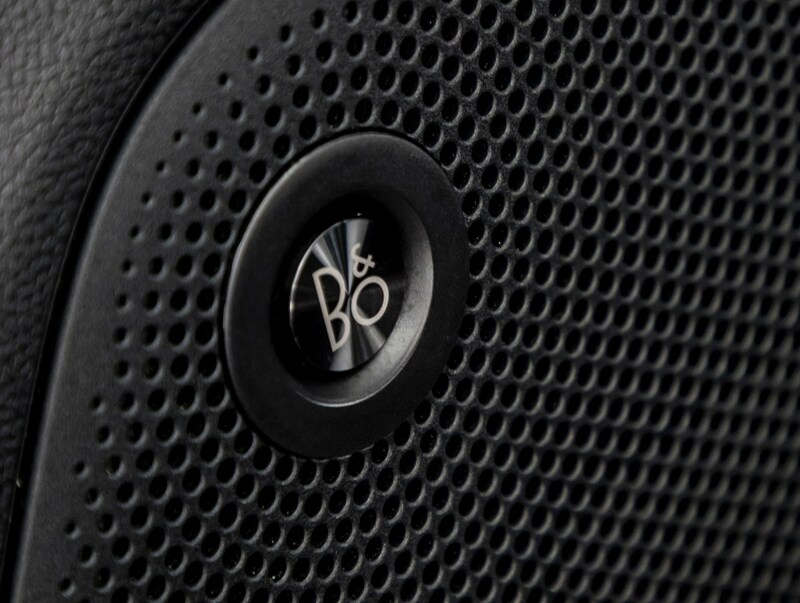 Buoyed by a new platform, lots of clever tech, excellent practicality and an overall drive that most of its rivals can only dream about – it’s the real deal. 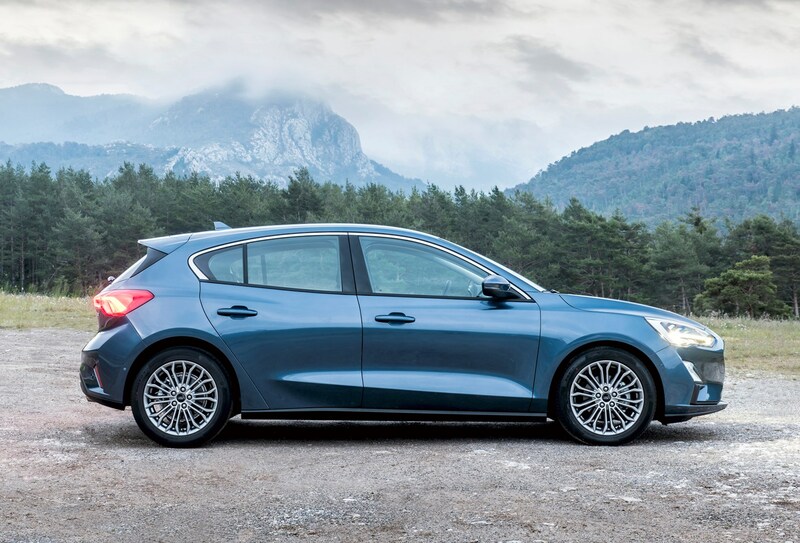 A lack of any hybrid, electric or performance versions may harm its outright score, but make no mistake, this is damn near every bit as good as Volkswagen’s benchmark Golf hatchback – and given that it's cheaper to buy, that makes it, just about, the class champion.